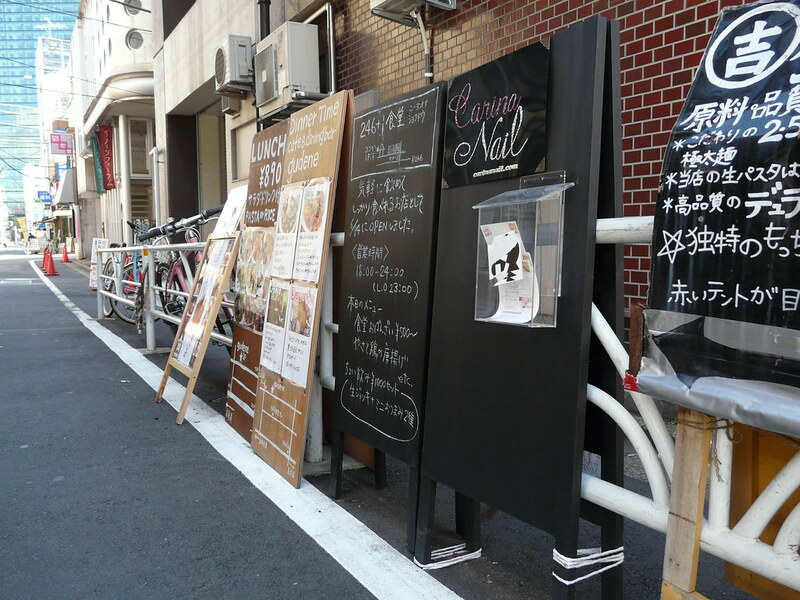 Railing at the entrance to a below ground level restaurant transformed into an oversize menu/promotion board with extensive use of tape and laminated paper. 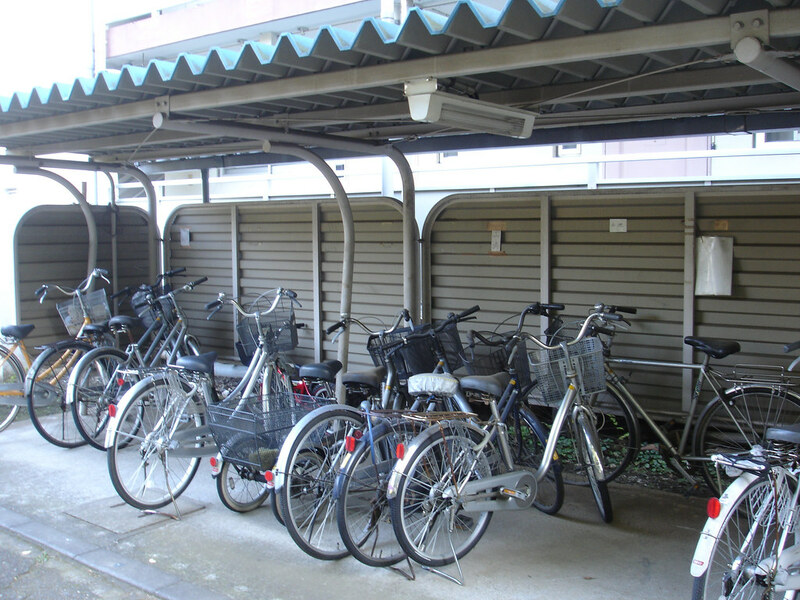 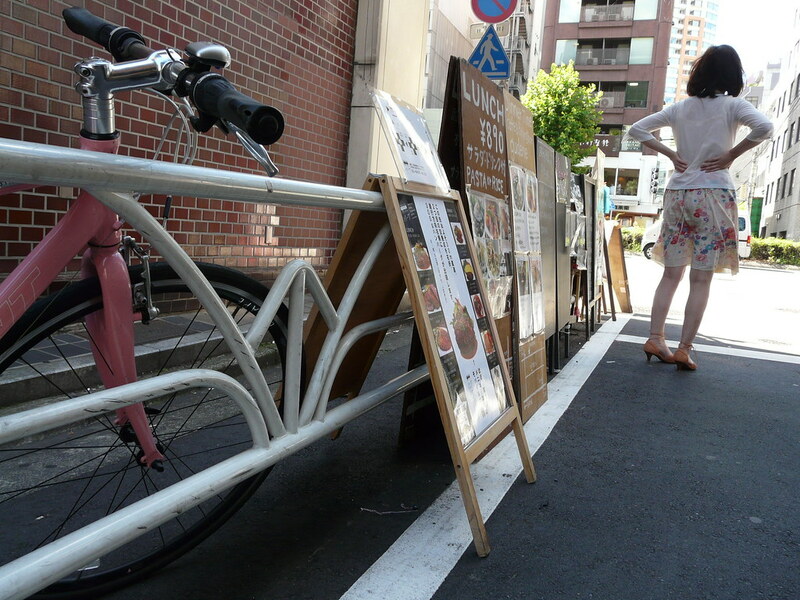 Apartment bike parking, which is often free-space, ordered into fixed parking spaces with paper and tape. 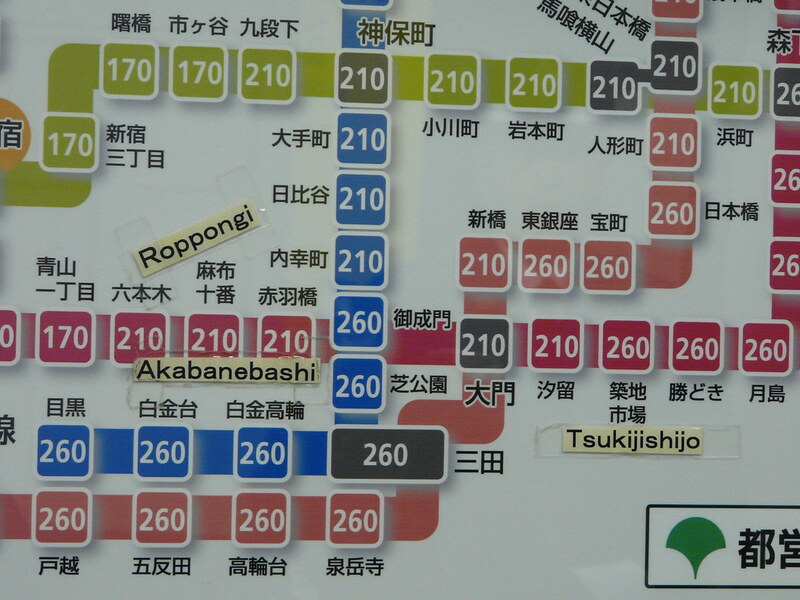 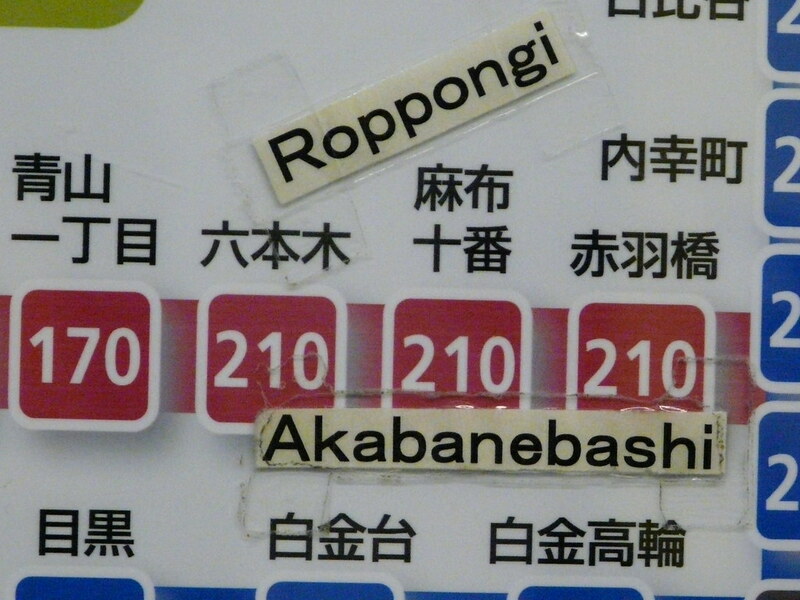 Shinjuku station signage, bilingual in all the important places. 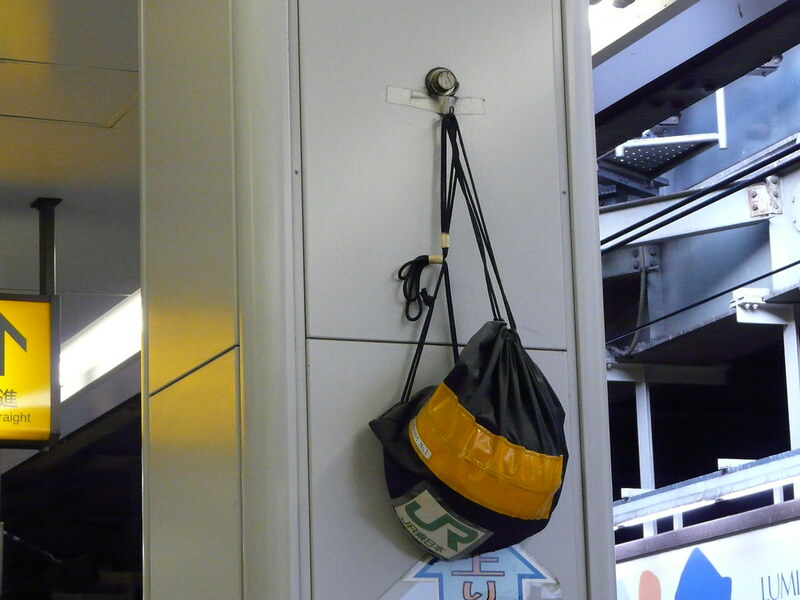 Train station emergency kit stored on a hook and secured with tape. 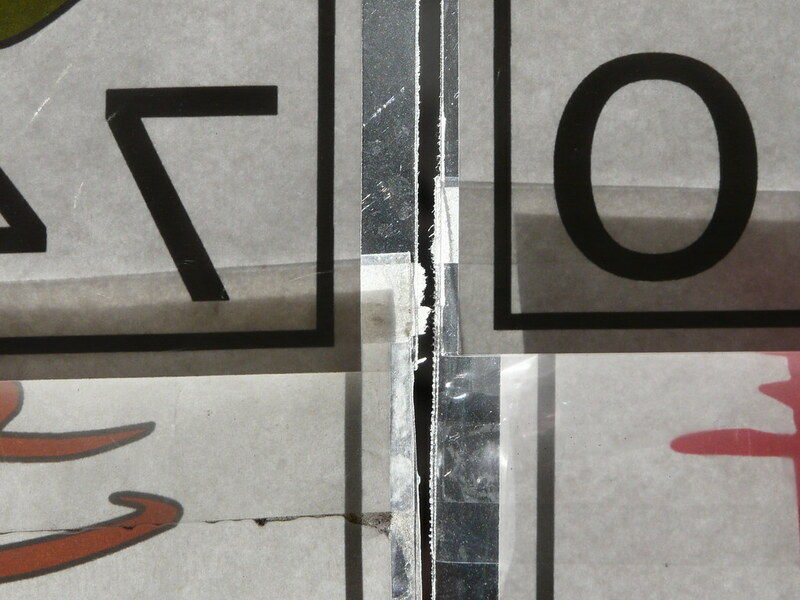 Lunchtime signage on polystrene food packaging lids – written in markers, stabilized with crate. 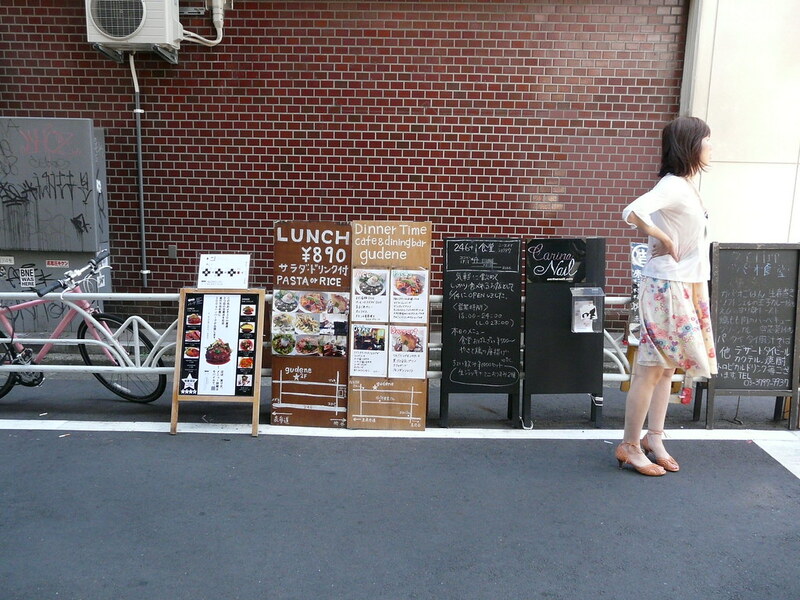 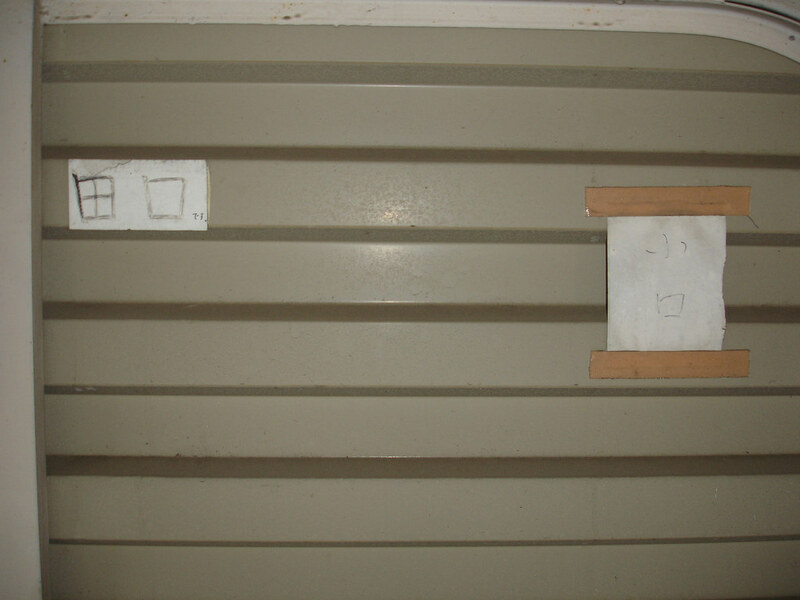 Signage is attached to hinged board for easy storage/transport (see last image). 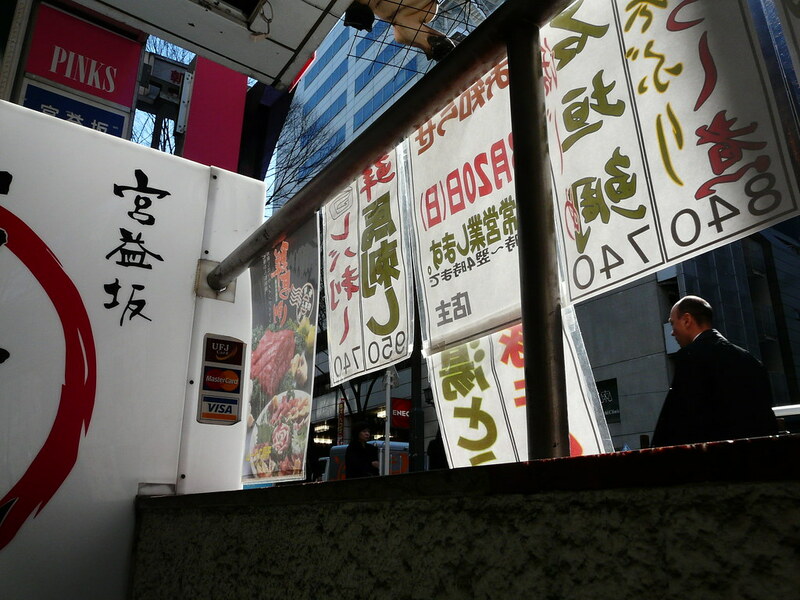 Signs advertising local restaurants lined up and stabilized over pedestrial railing. 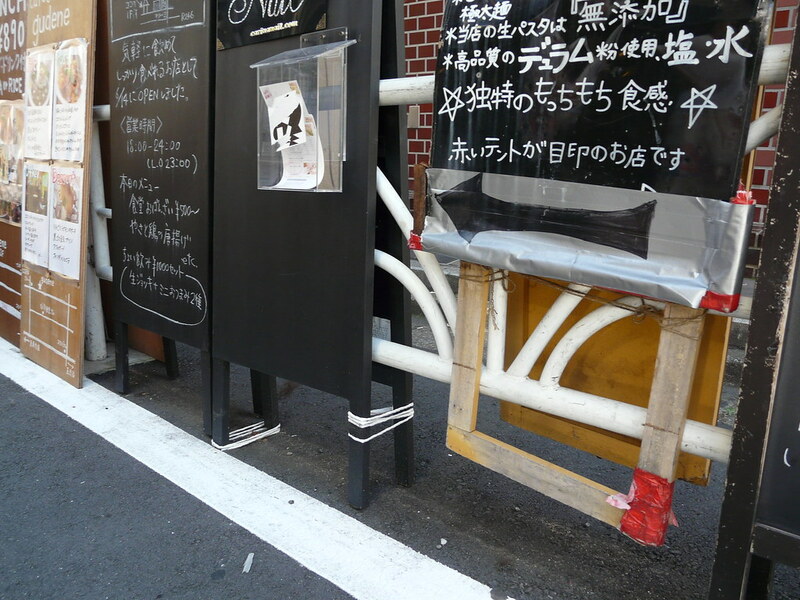 A system which also keeps them off the thoroughfare. 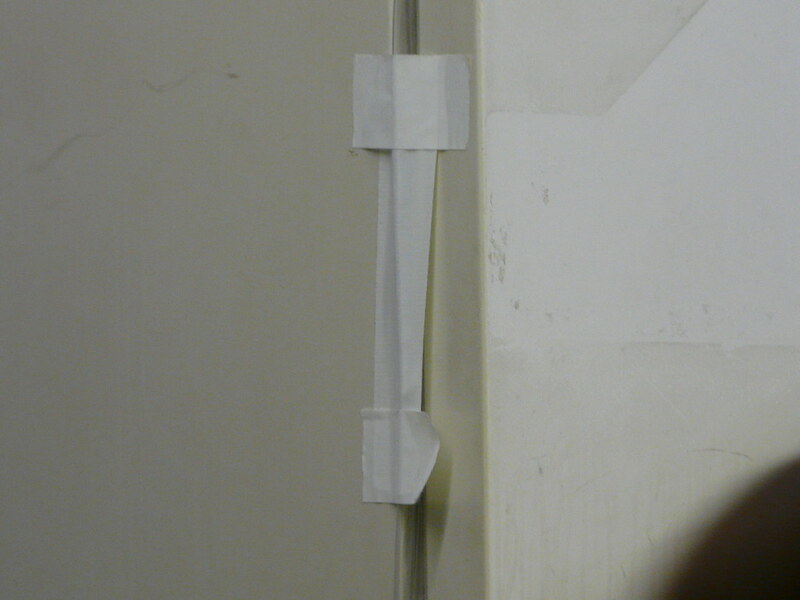 Stabilized with tape and string. 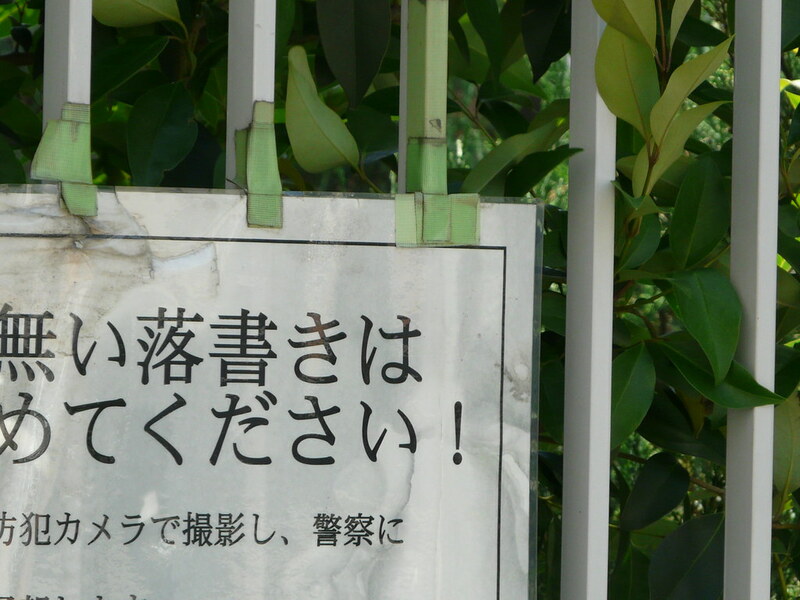 Laminated A4 signs affixed with tape proclaim night use of the park prohibited, and encourage people to call the police emergency line if they see anyone suspicious. 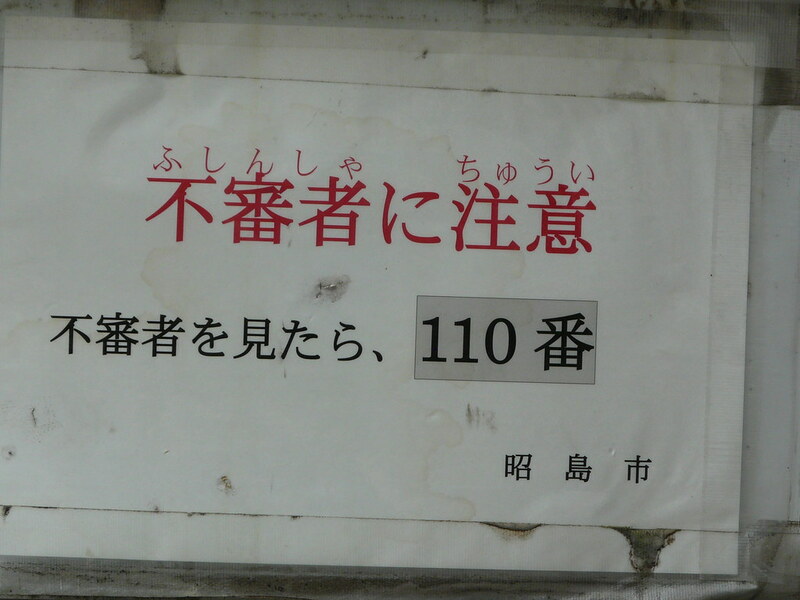 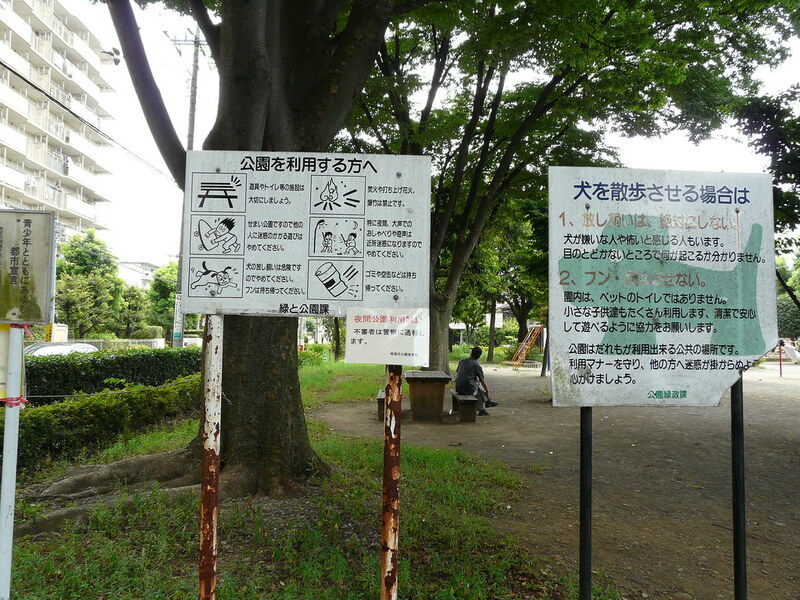 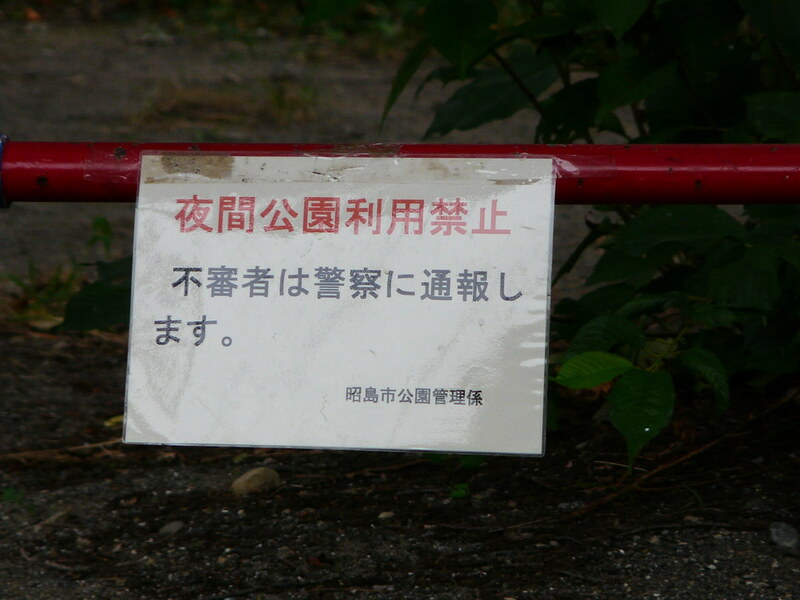 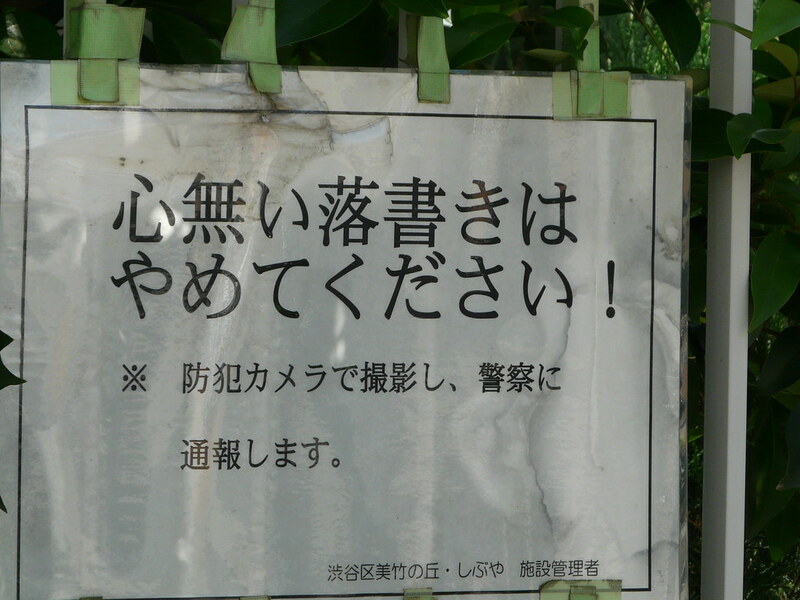 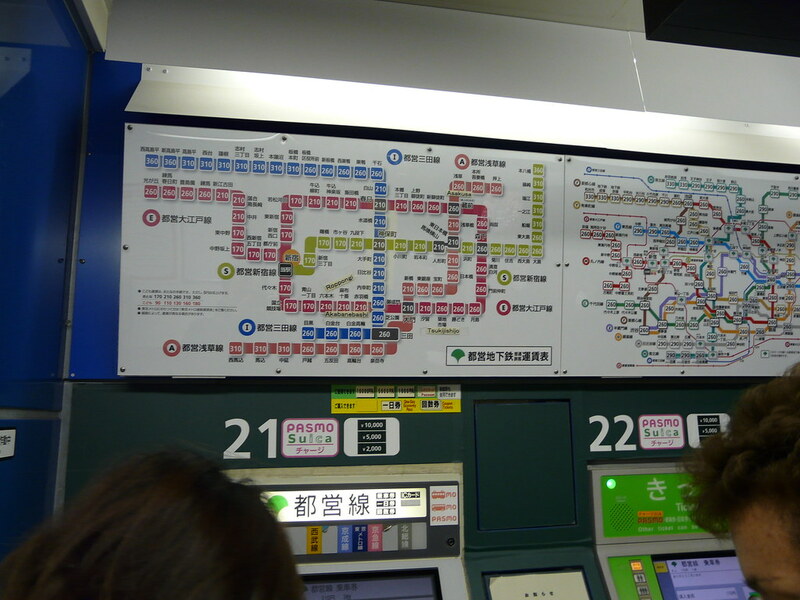 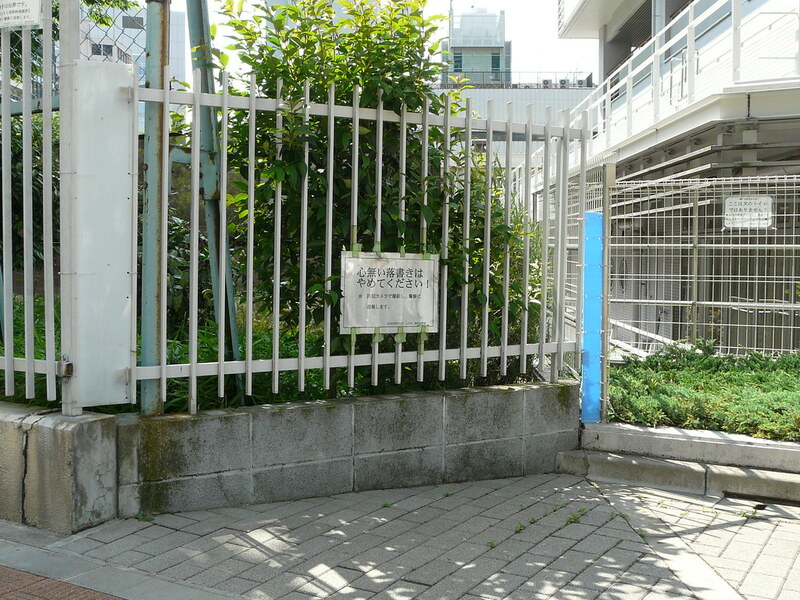 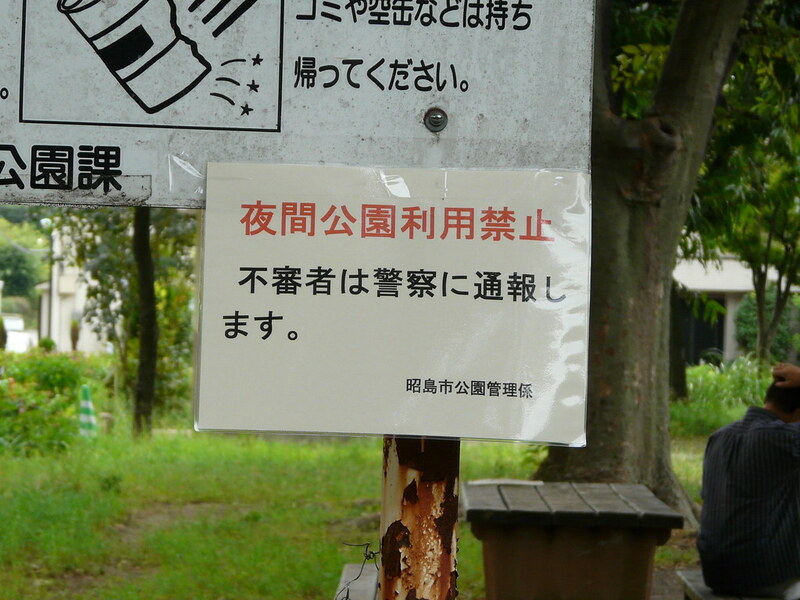 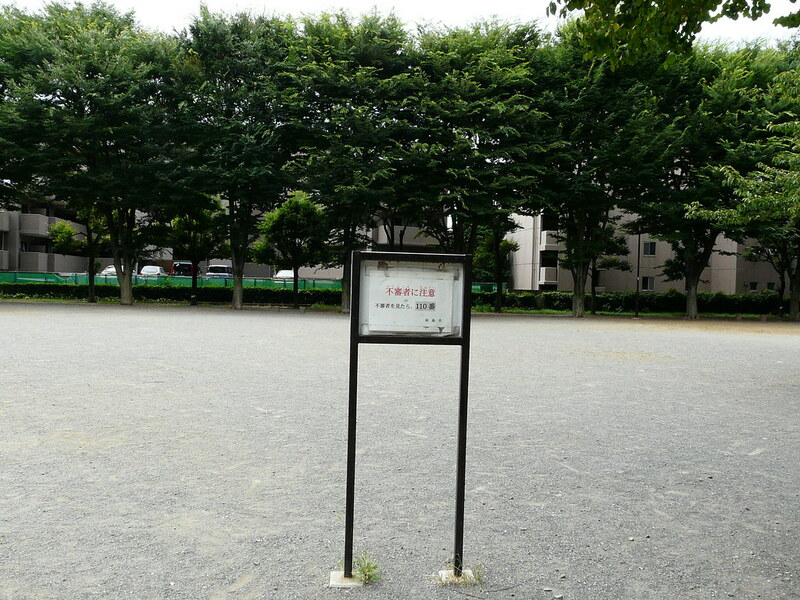 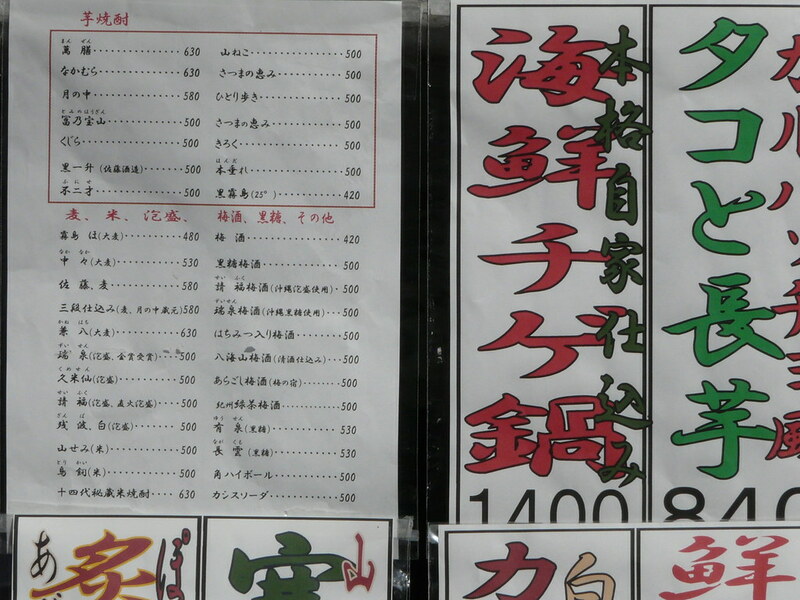 The signs are ambiguously official, being layed out in generic Excel style and signed with a simple ‘Akishima City’ or ‘Akishima City Park Authority’ – they look like they could have been made by anyone. 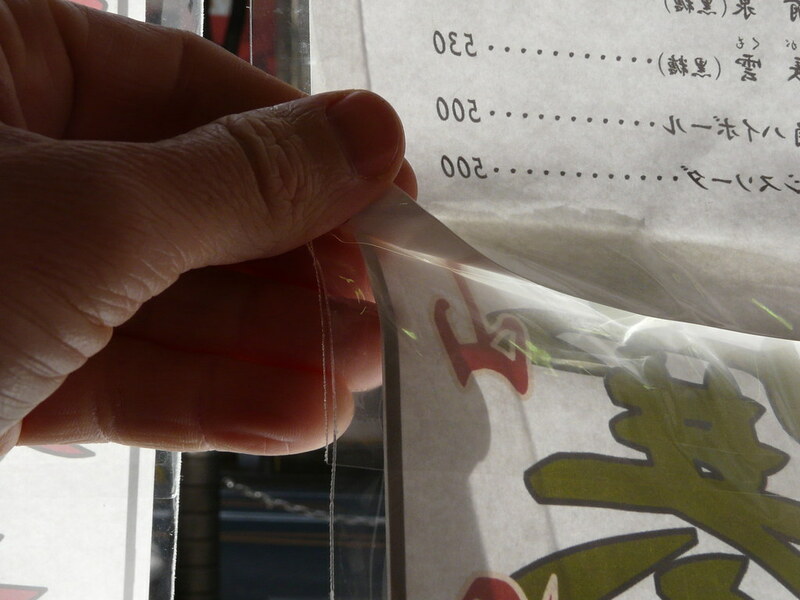 I removed one as a test, and it was replaced promptly. 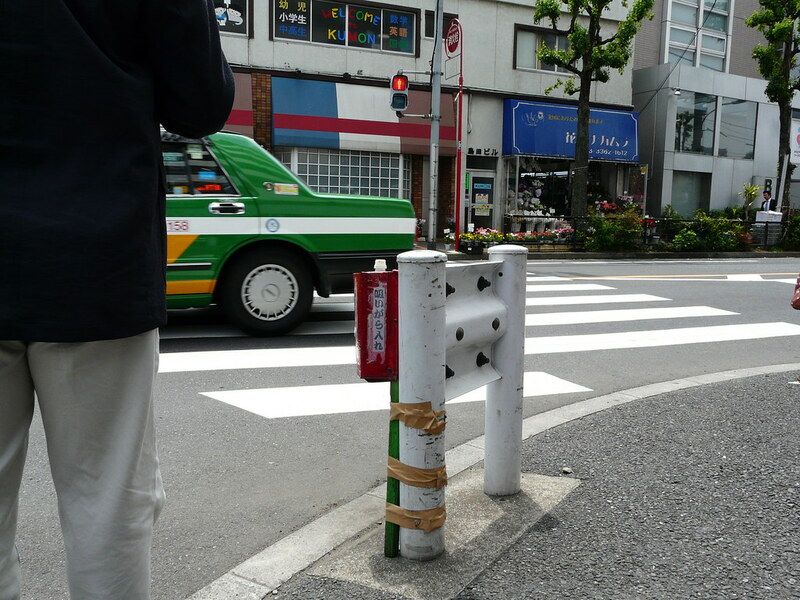 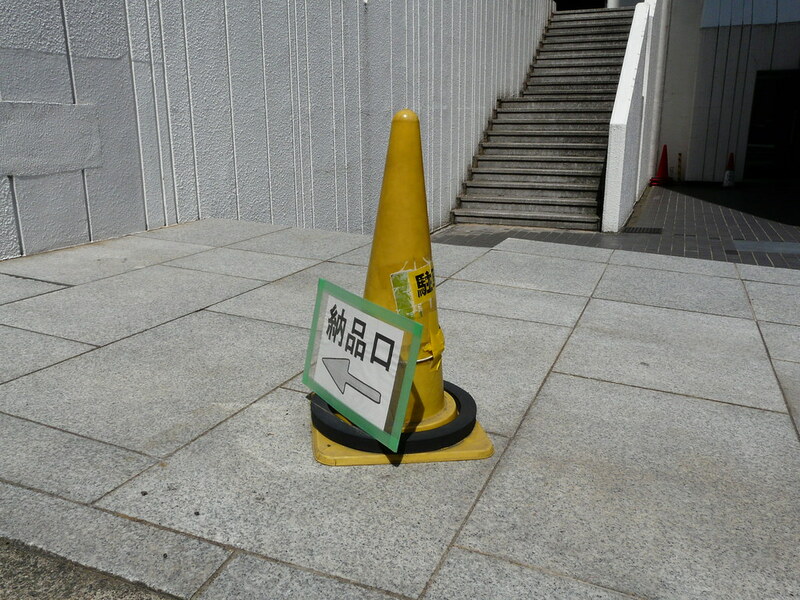 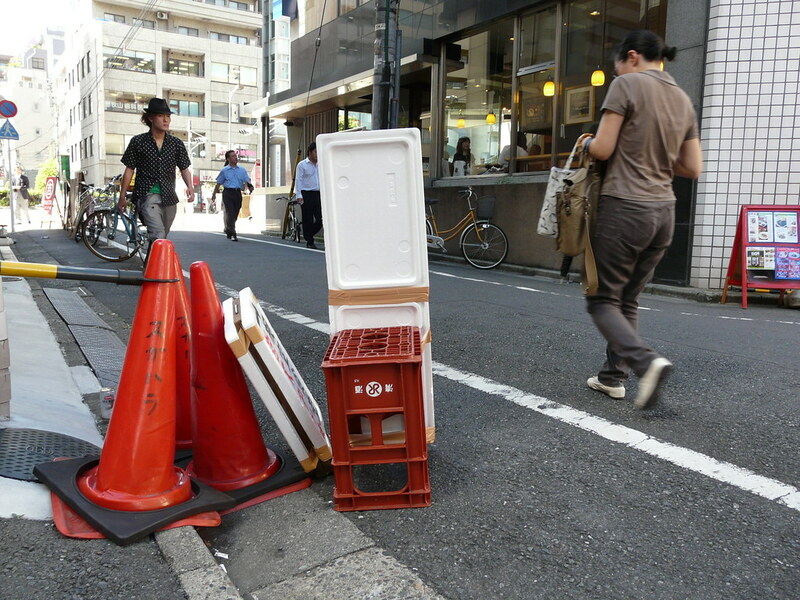 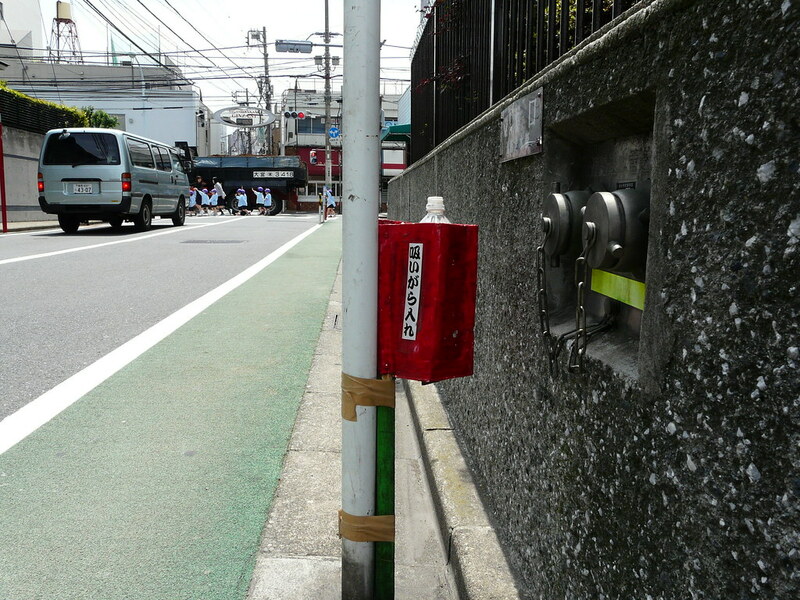 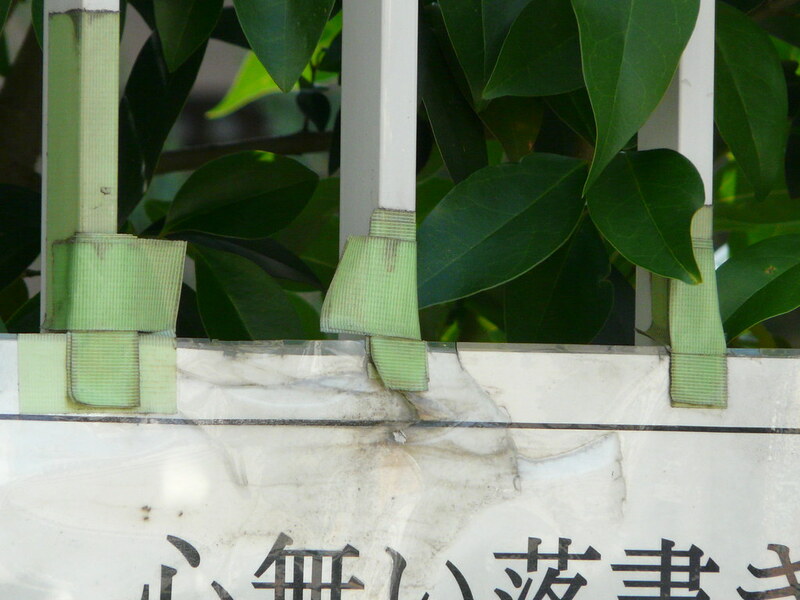 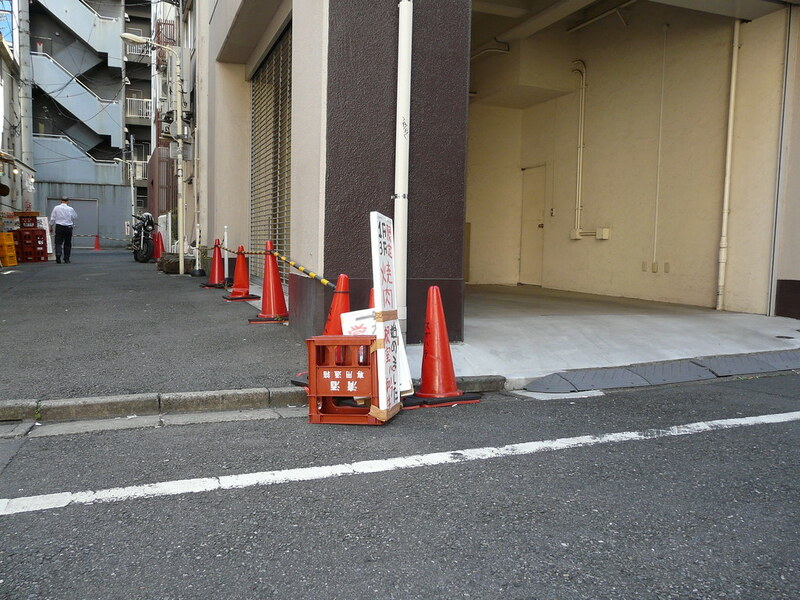 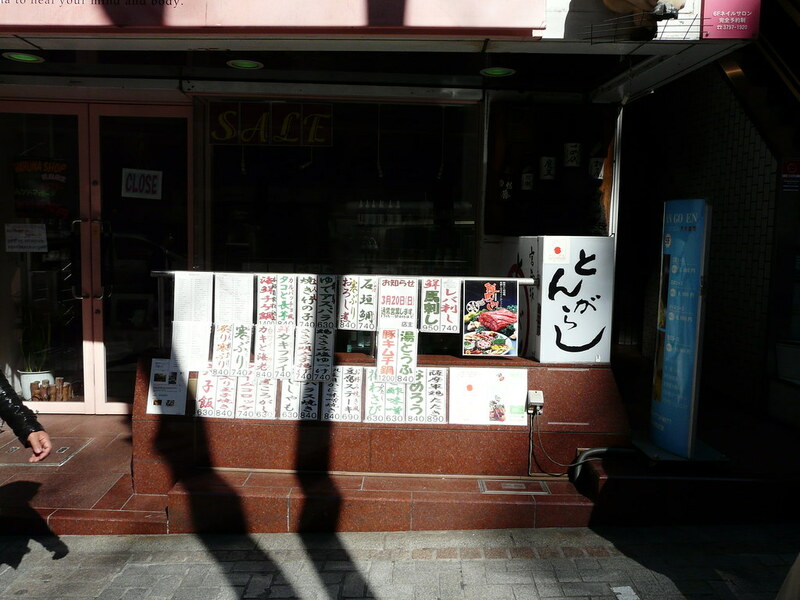 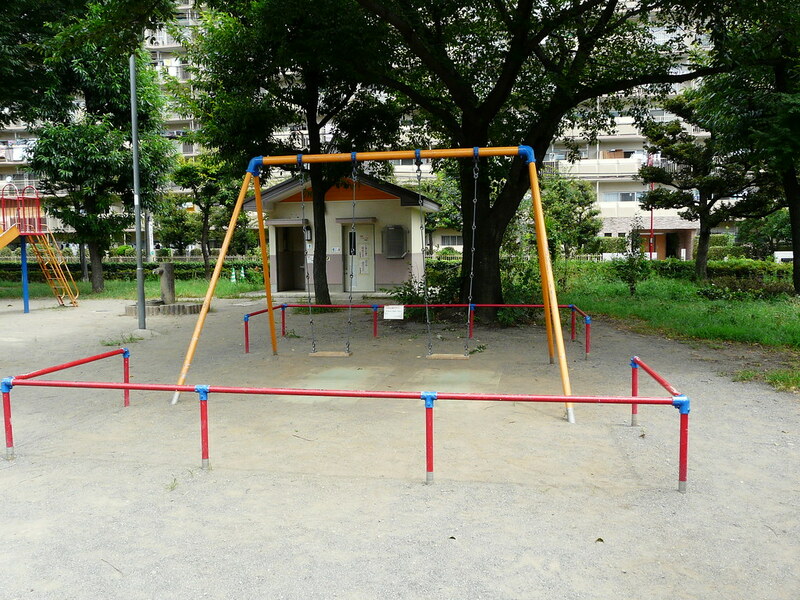 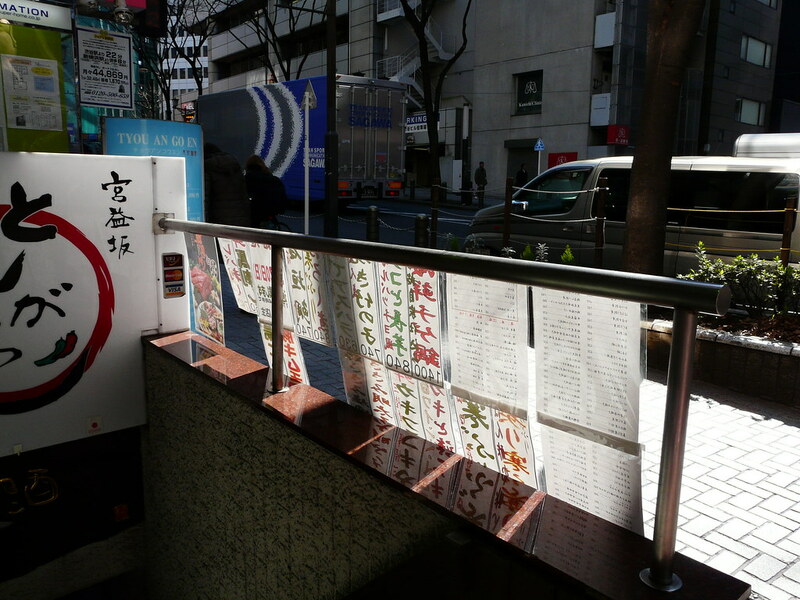 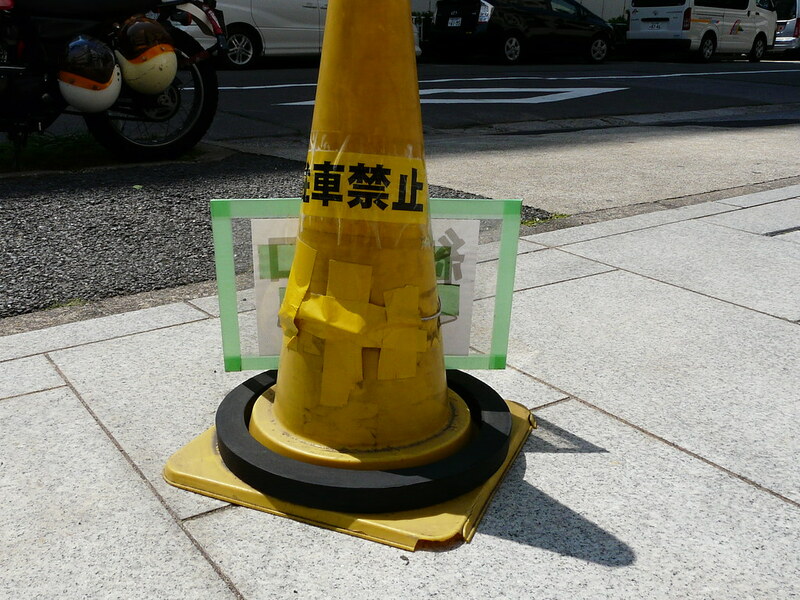 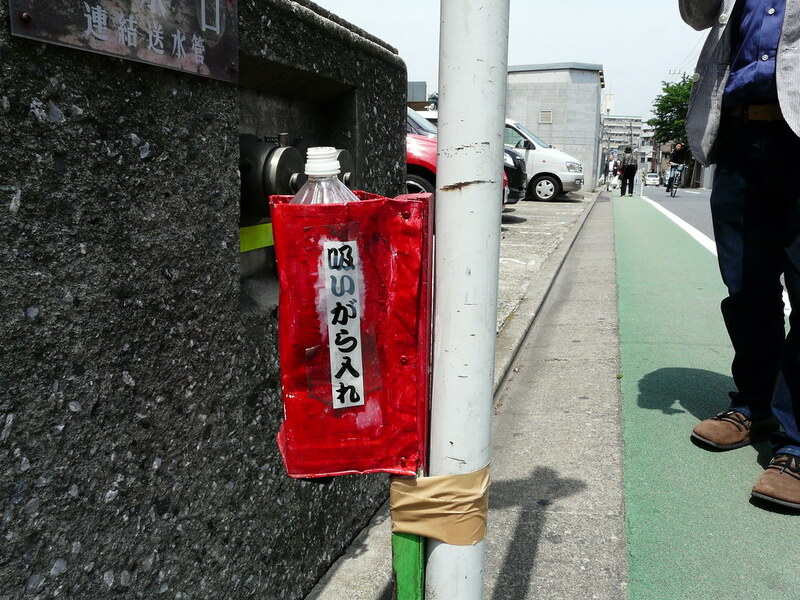 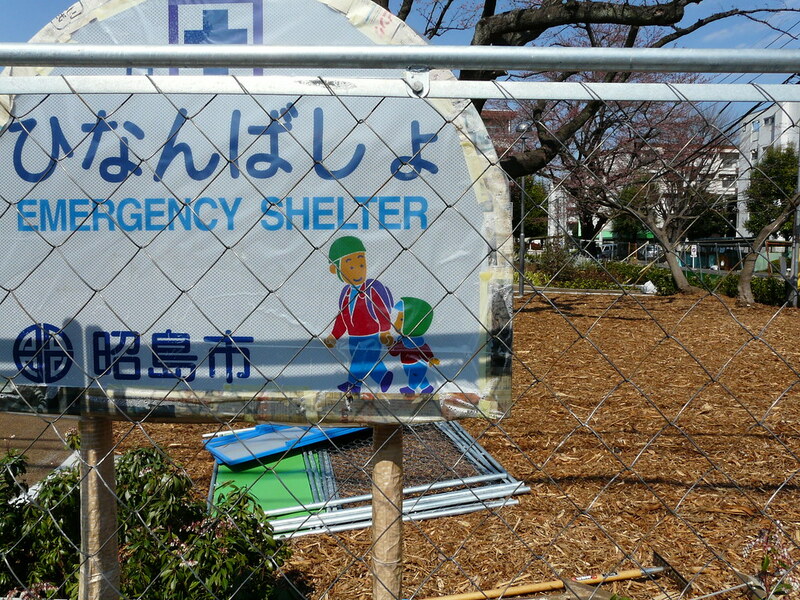 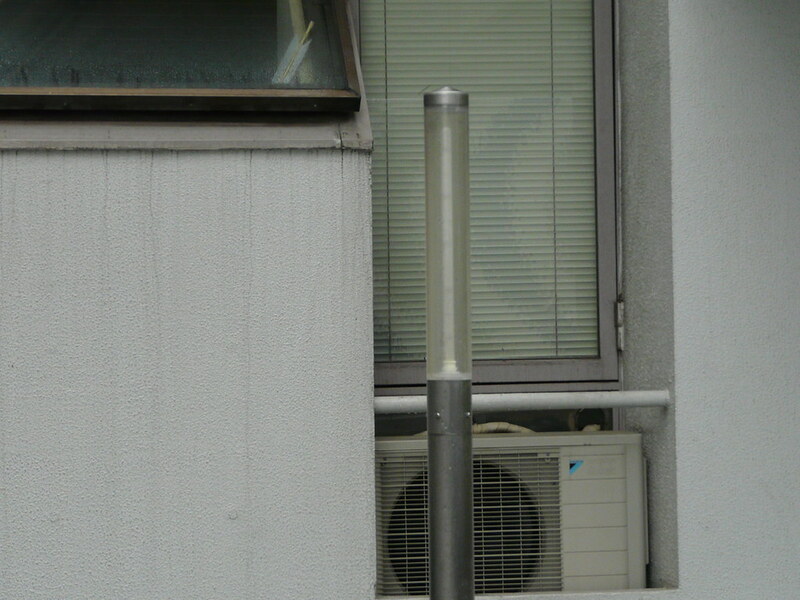 When I placed my own sign (as part of the kokonohanashi project) it was promptly removed. 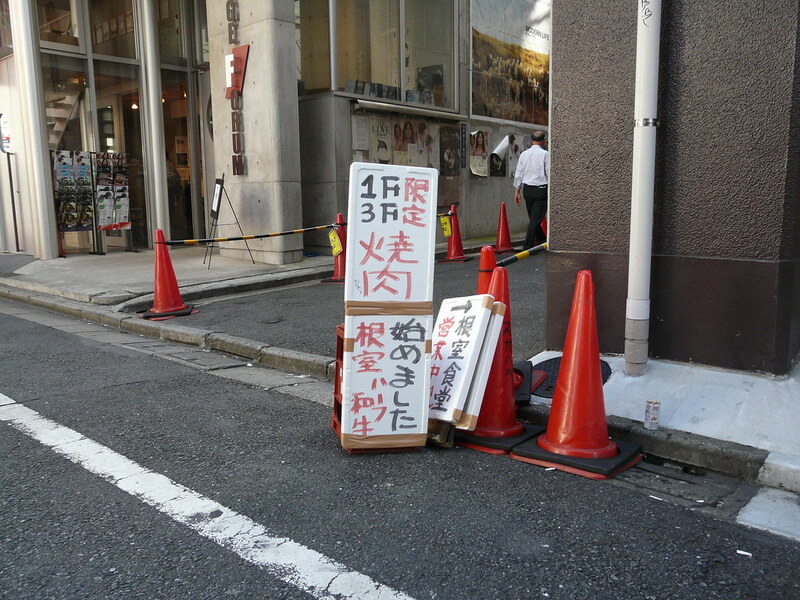 So it appears the signs are official, or at least part of a dedicated campaign. 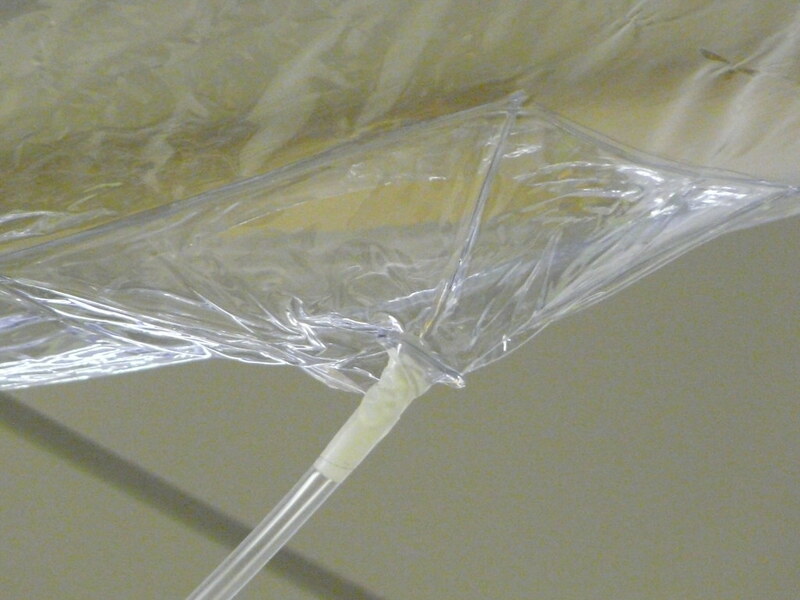 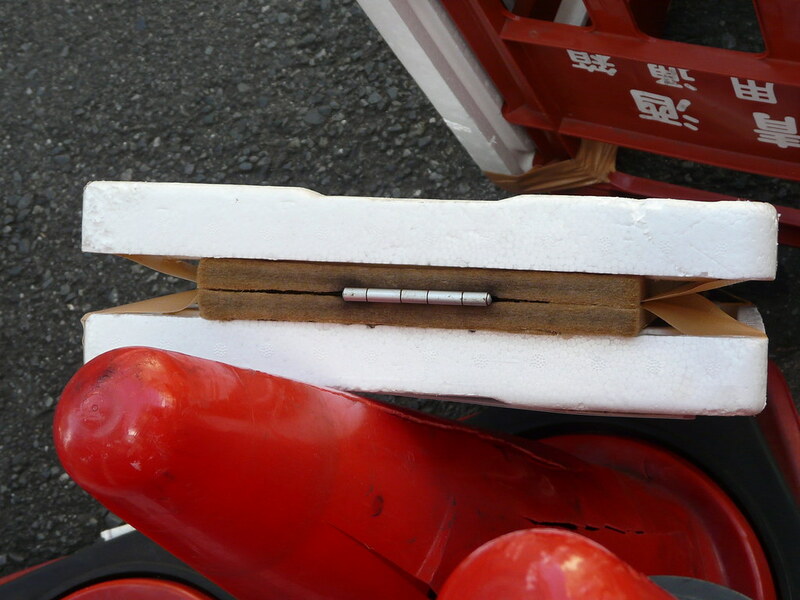 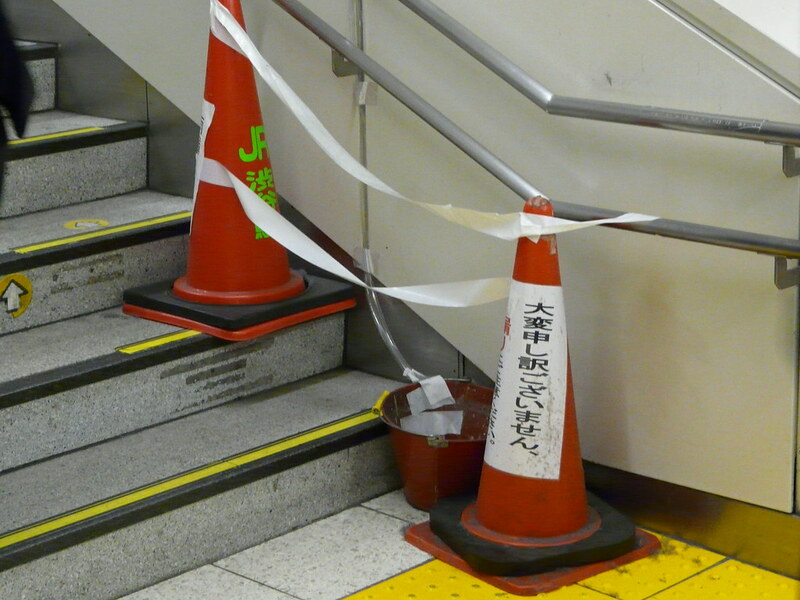 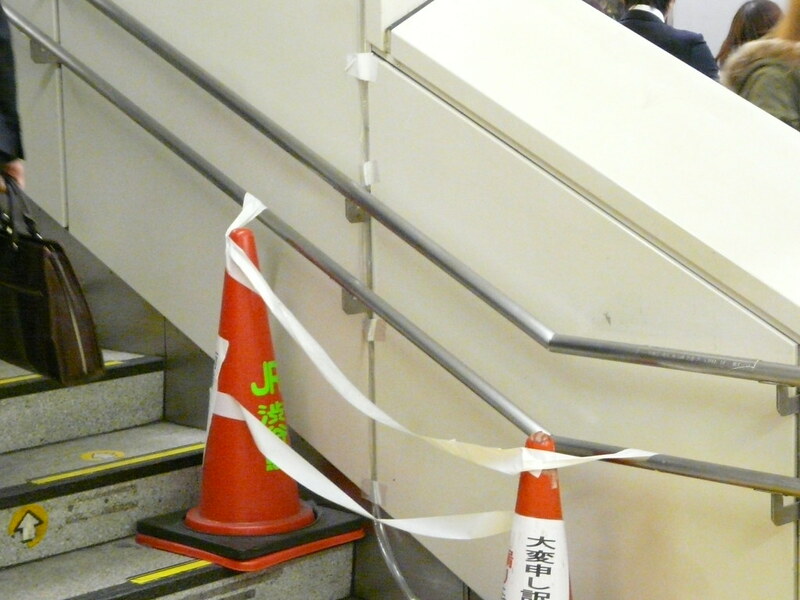 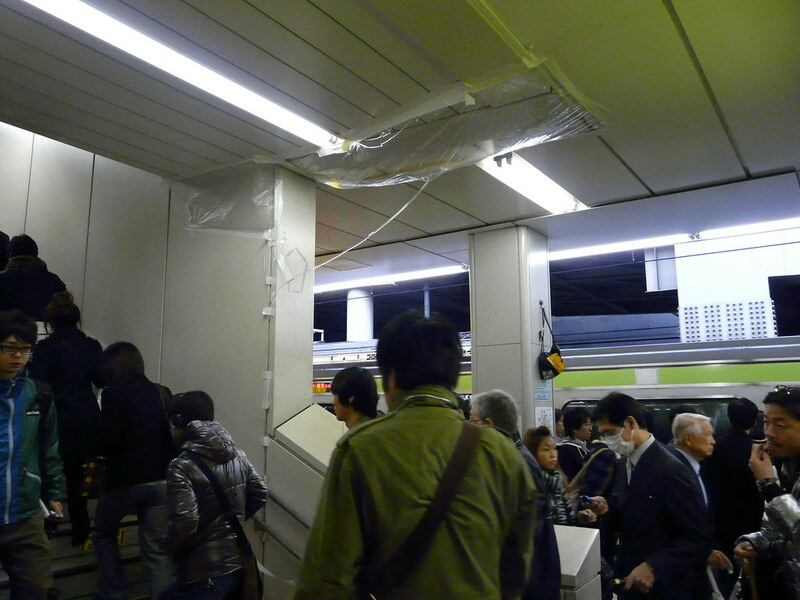 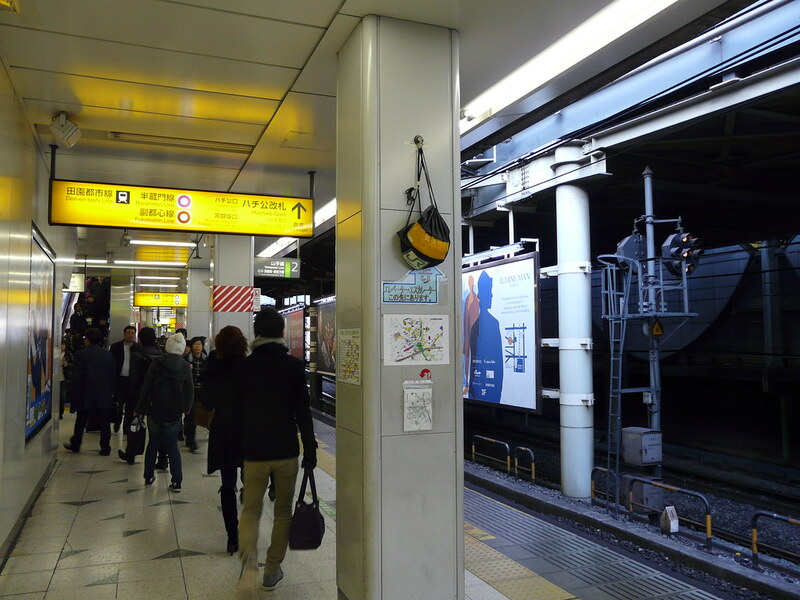 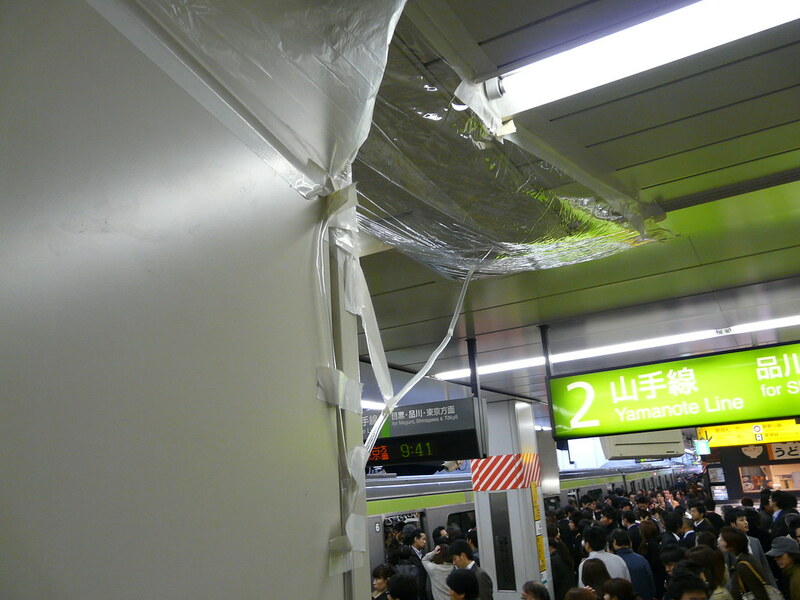 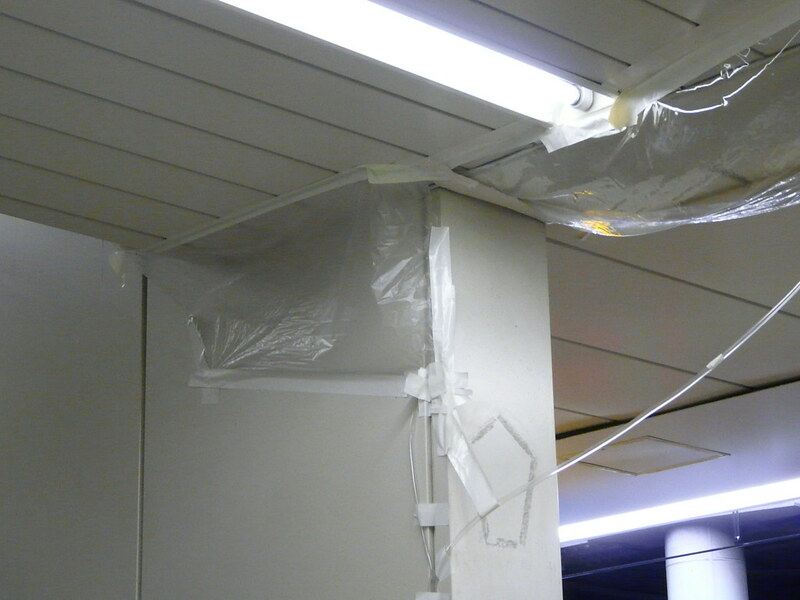 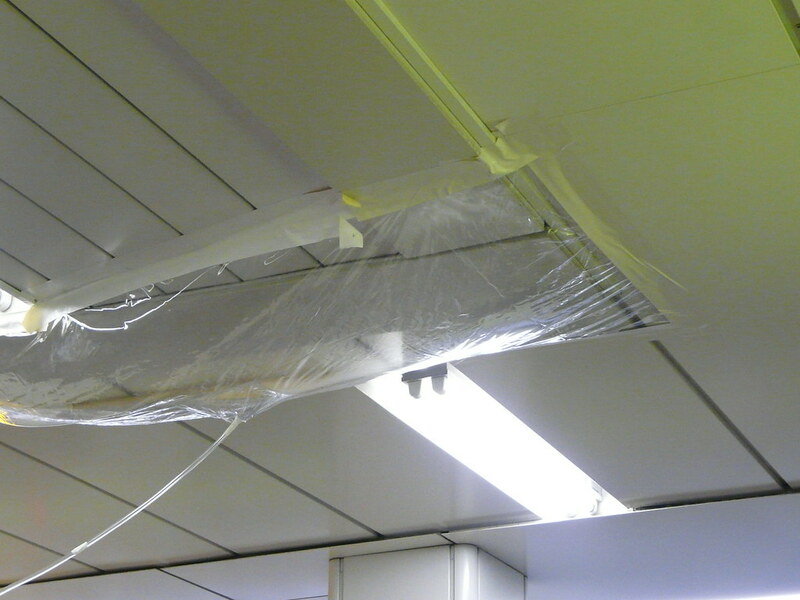 Plastic sheeting, tubes and tape used to deal with a leaky roof in Shibuya station. 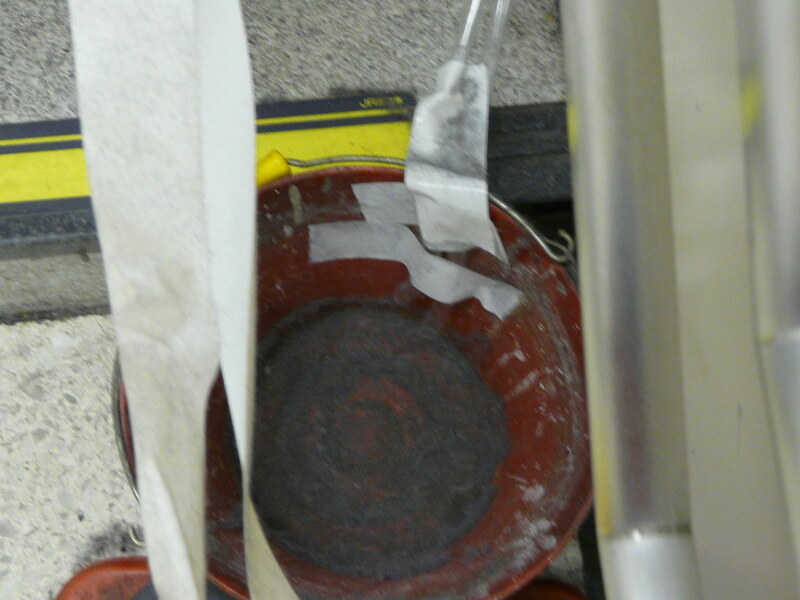 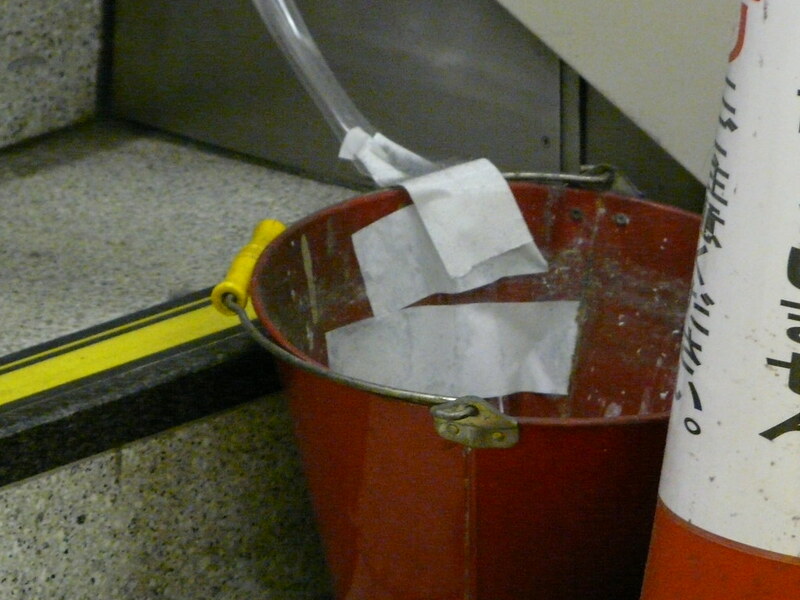 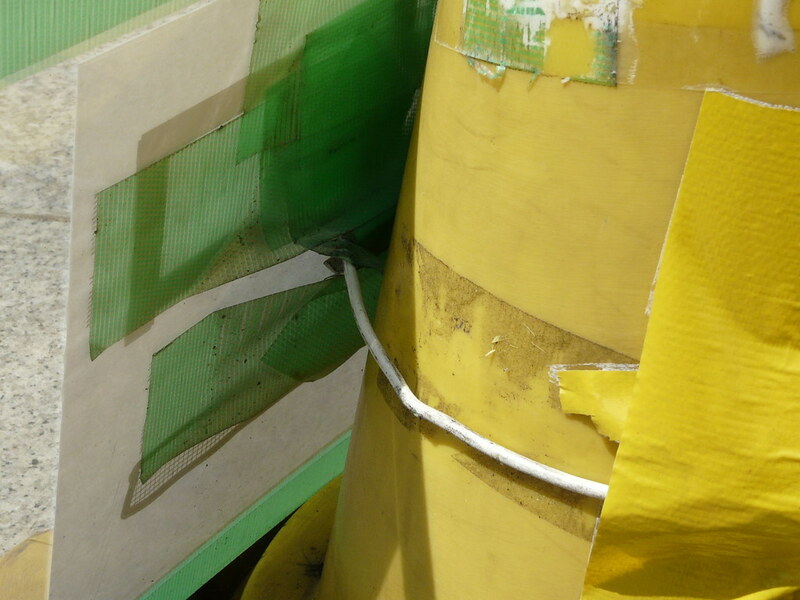 This work shows great skill and experience – from the placement and ‘give’ of the sheets to the way tape is used to adjust the angle of the tube and sheet to allow water to flow freely to the bucket placed at the bottom of the stairs. 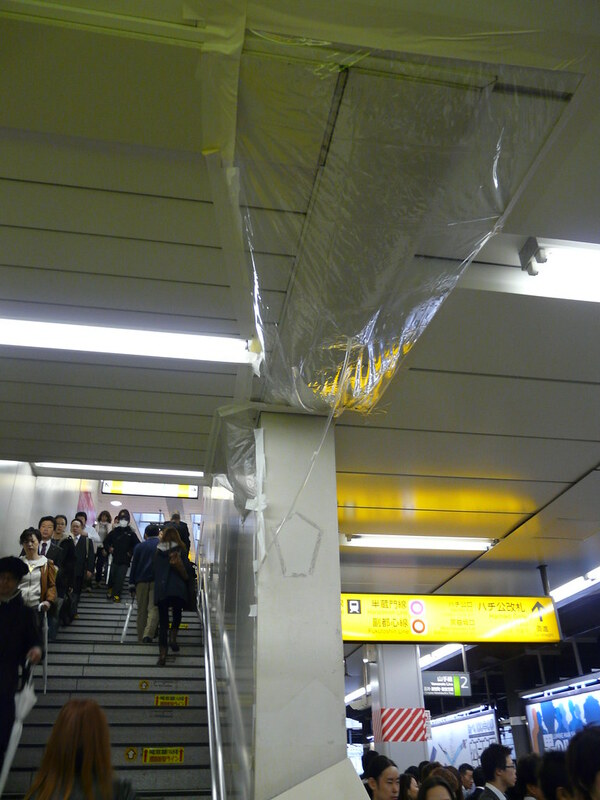 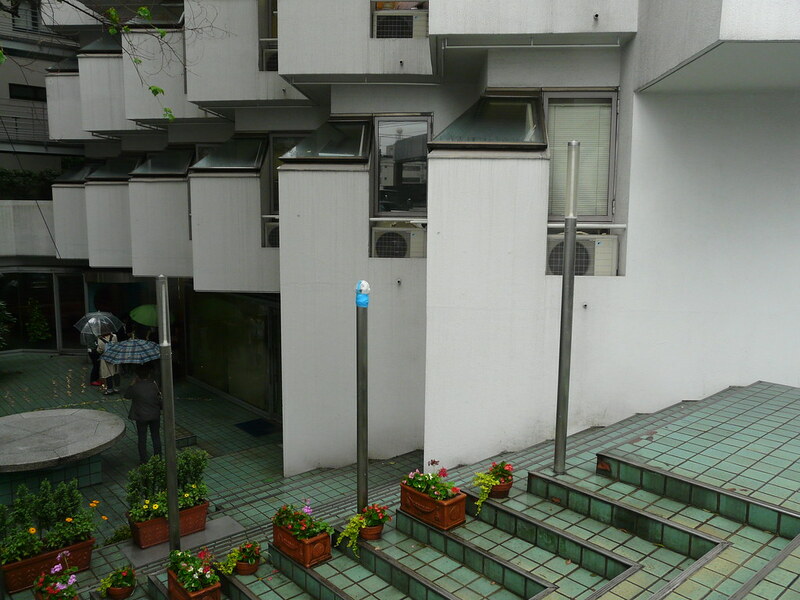 I know that this type of construction is common in stations during rainy periods….anyone else have any photos? 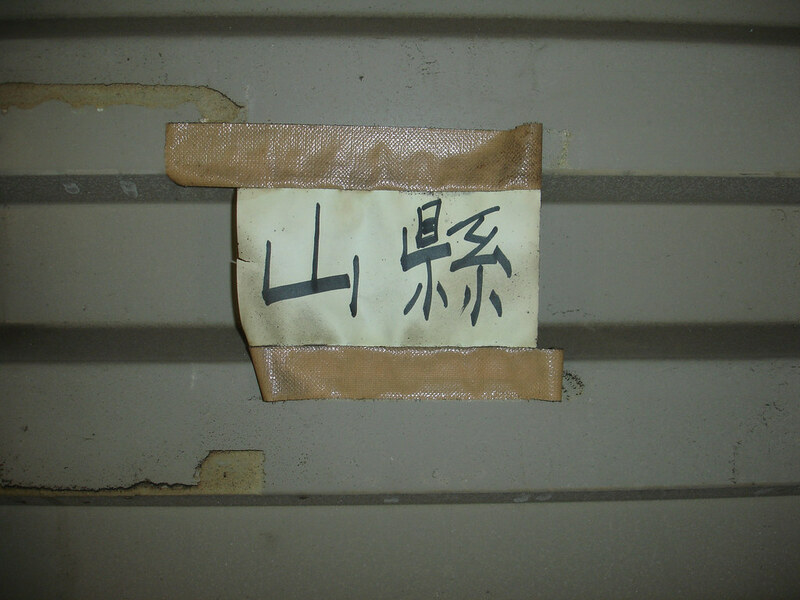 Plastic and tape cover old name plate in unoccupied house. 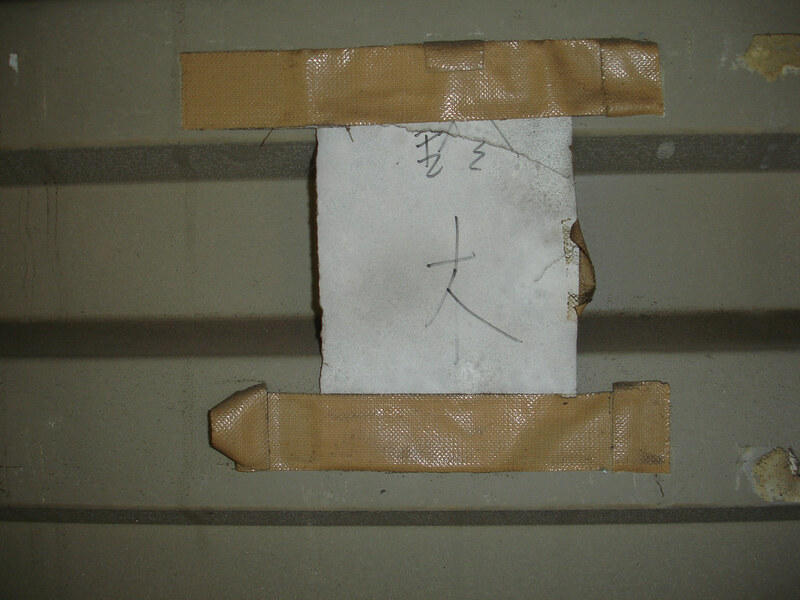 In an attempt to prevent graffiti this ‘official’ laminated A4 sign has been affixed with tape. 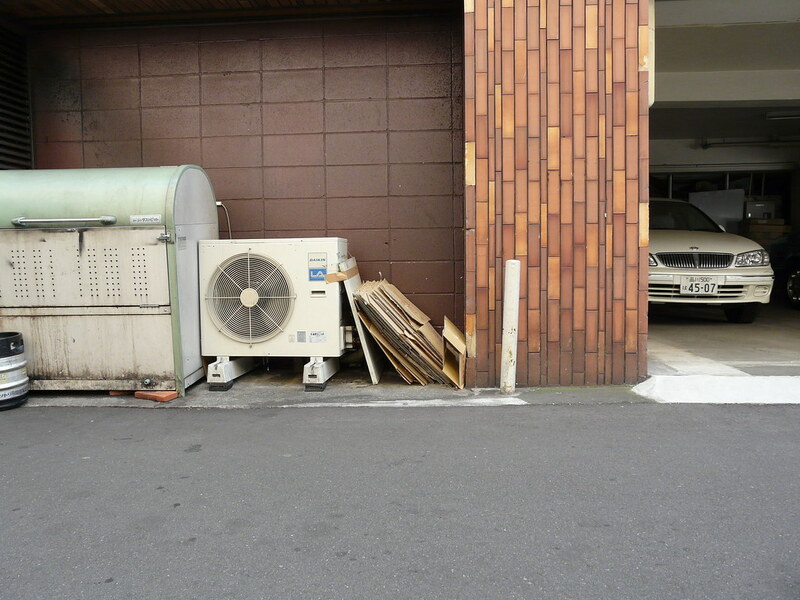 Wooden board leant on airconditioner and affixed with tape completes the transformation of dead-space to storage space. 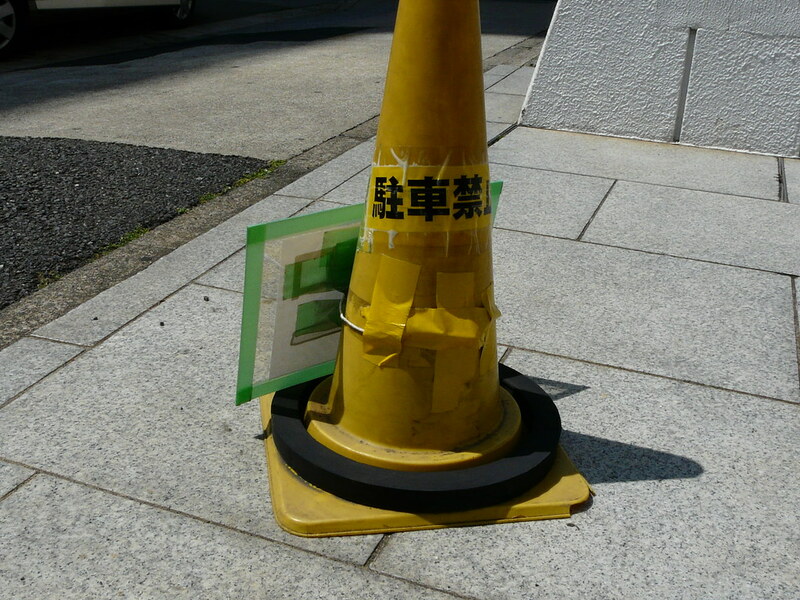 ‘Deliveries This Way’ signage constructed from A4 printed sign between perspex and secured to cone with duct tape. 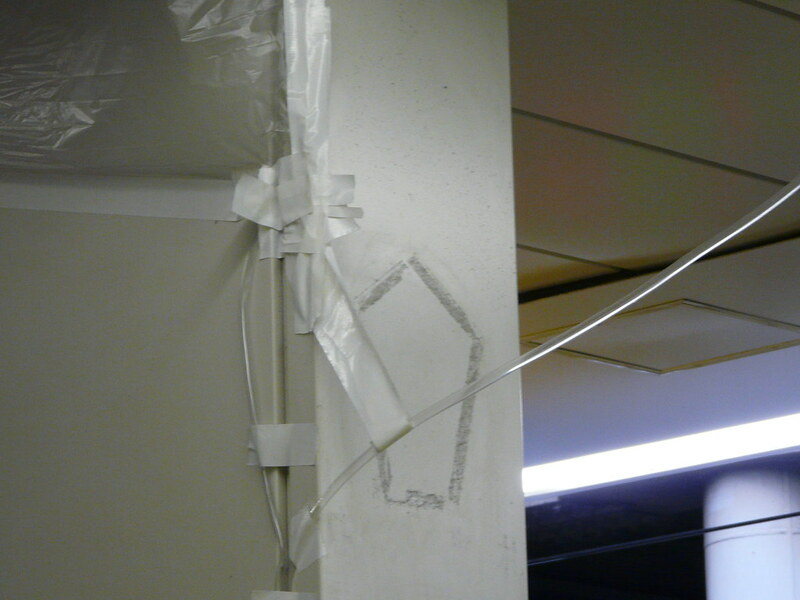 Broken light waterproofed with a plastic back and tape. 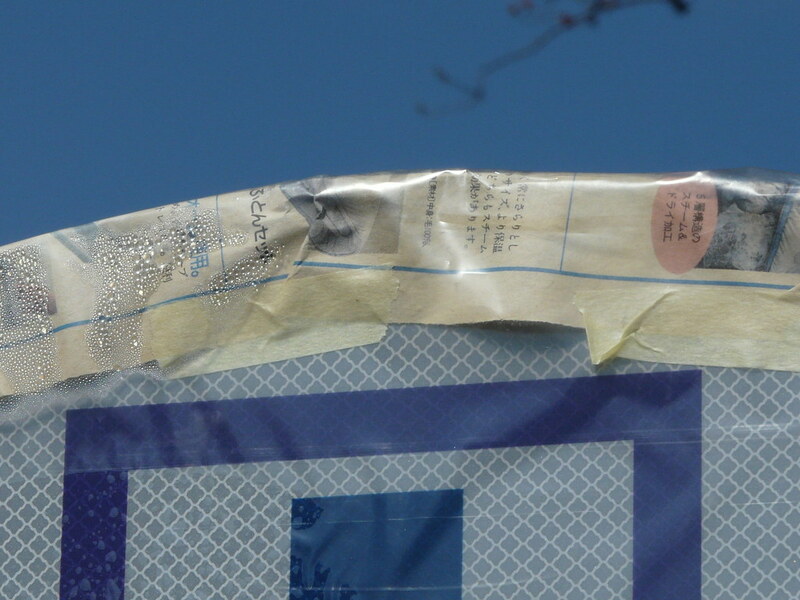 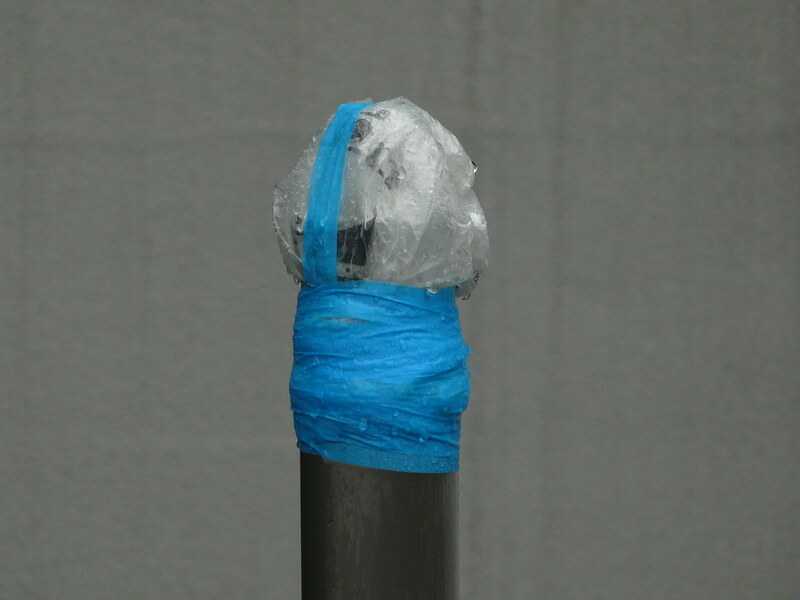 Newspaper and tape wrap around the edges of a new sign in a park, awaiting the official unveiling. 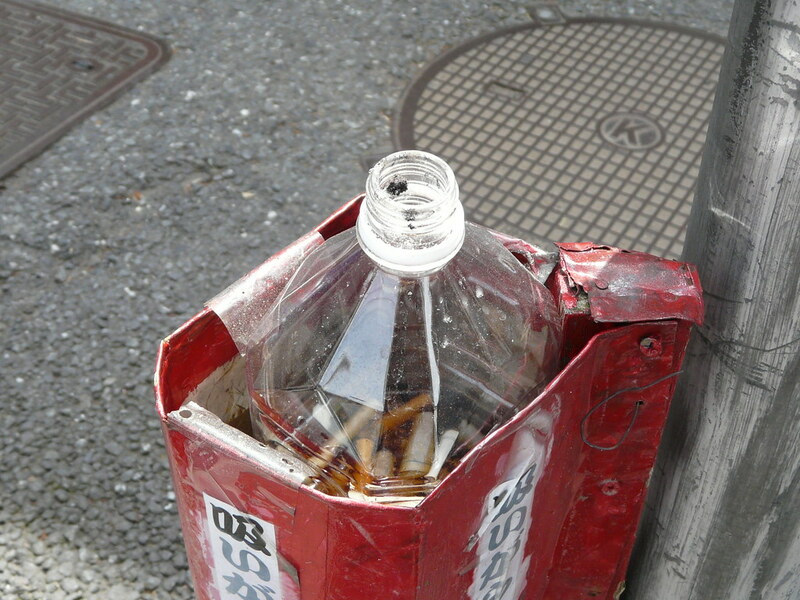 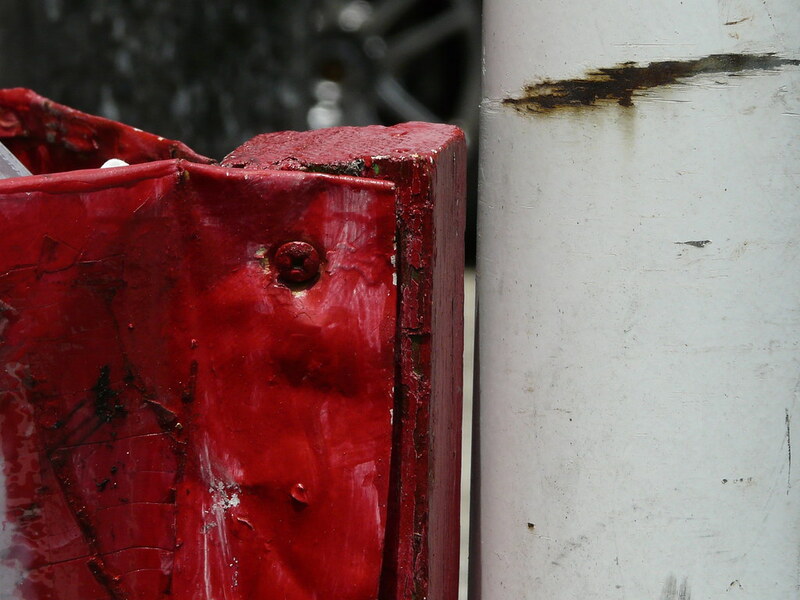 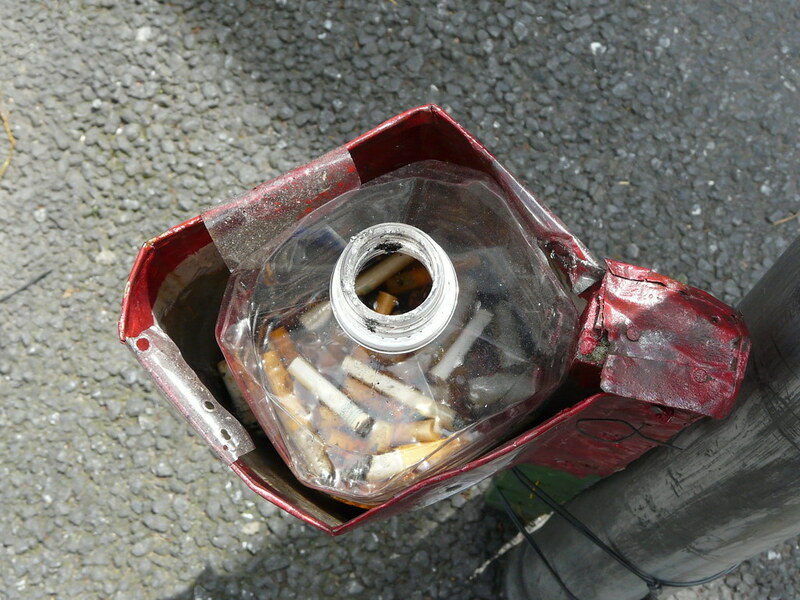 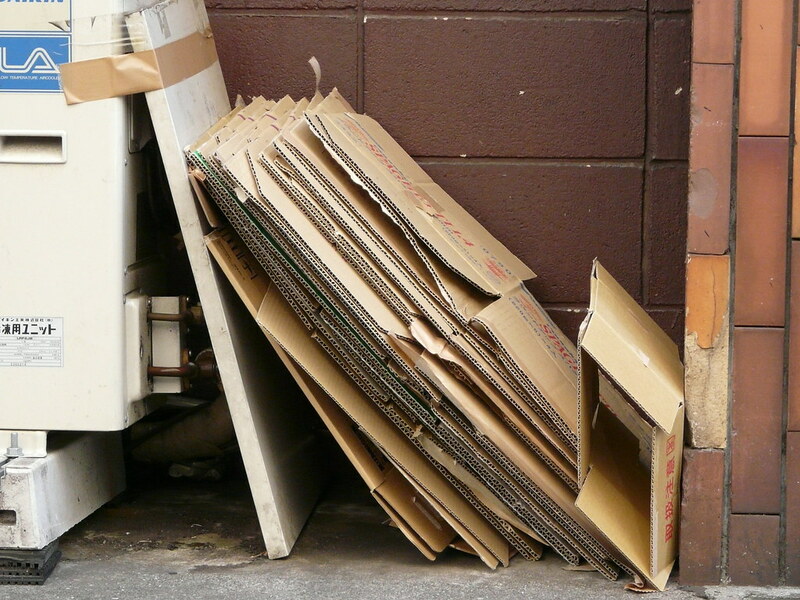 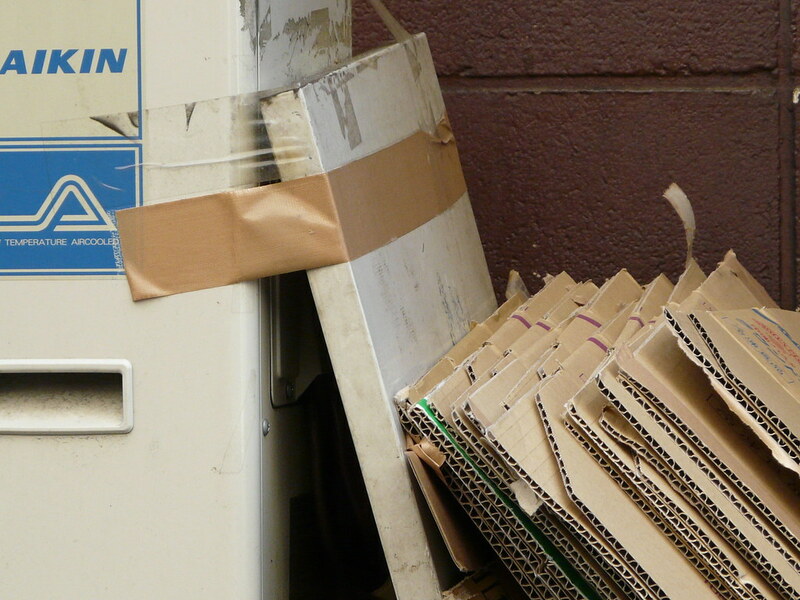 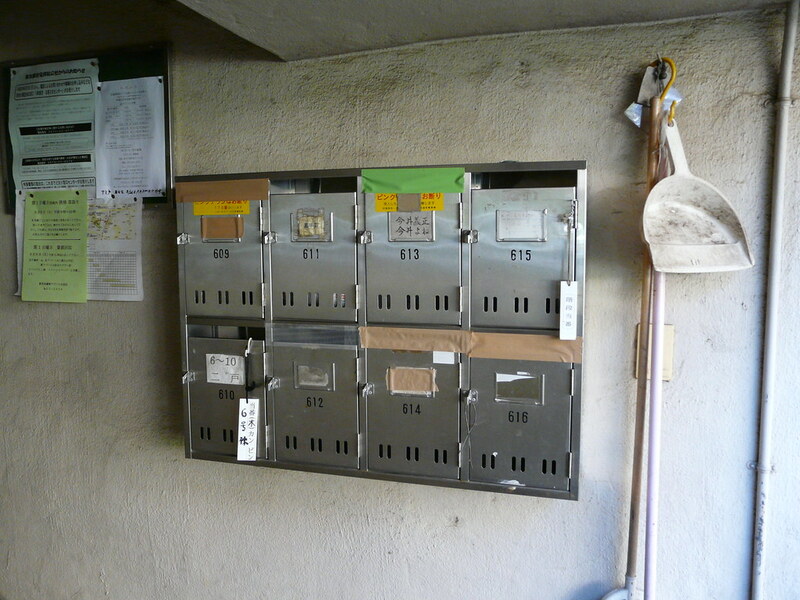 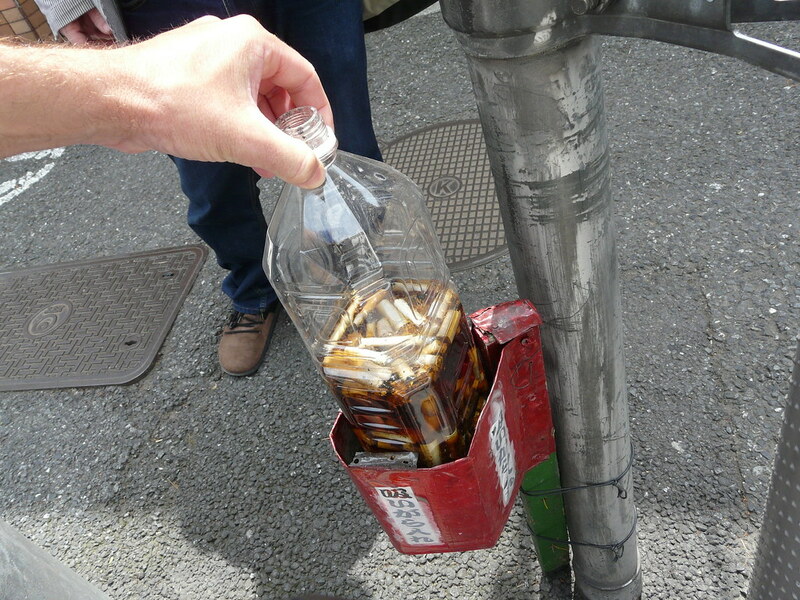 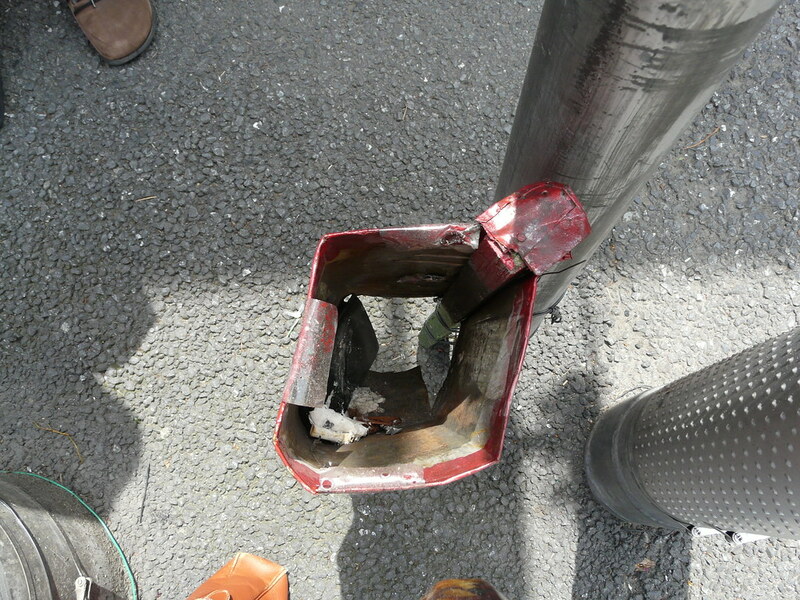 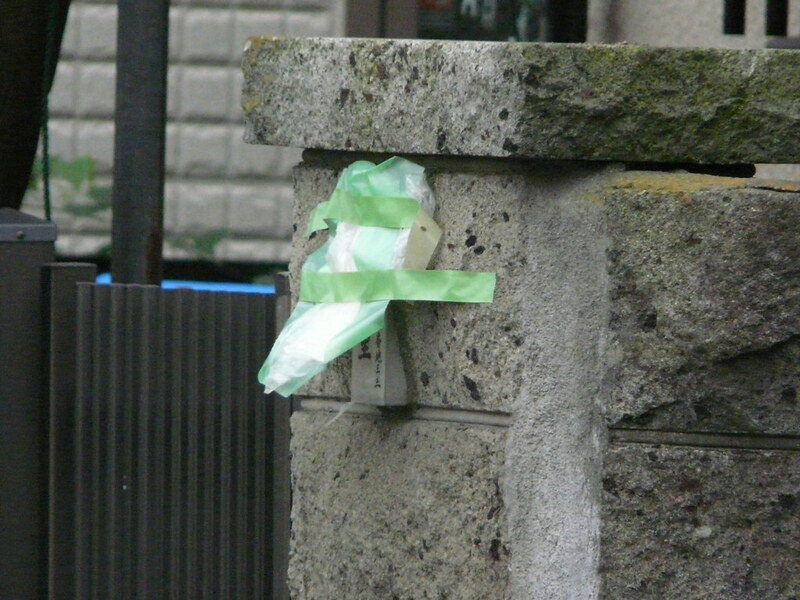 The practice of taping up post boxes in apartment complexes stops excess junk-mail and also serves as a signal as to which apartments may be available for rent. 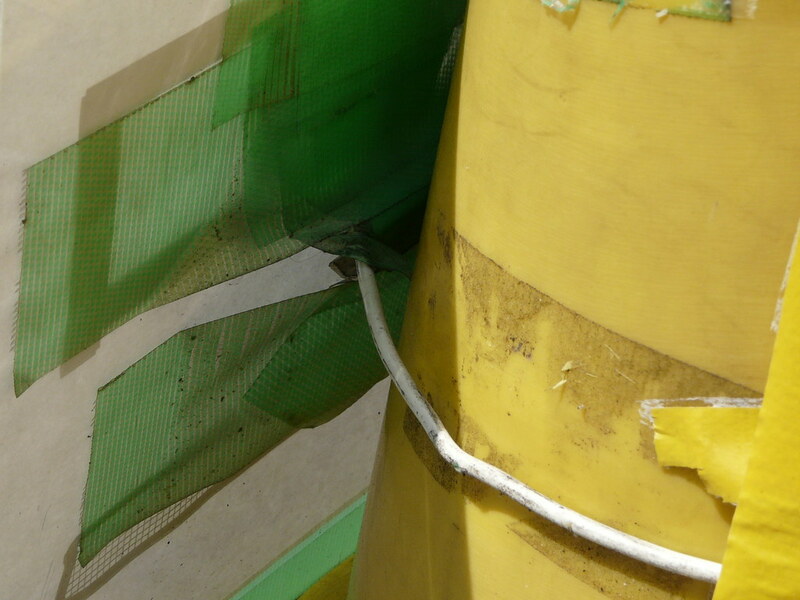 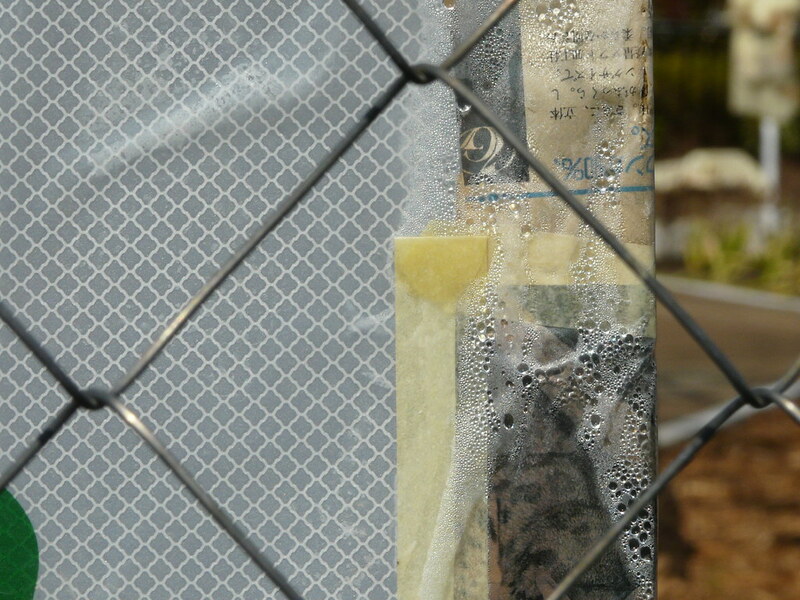 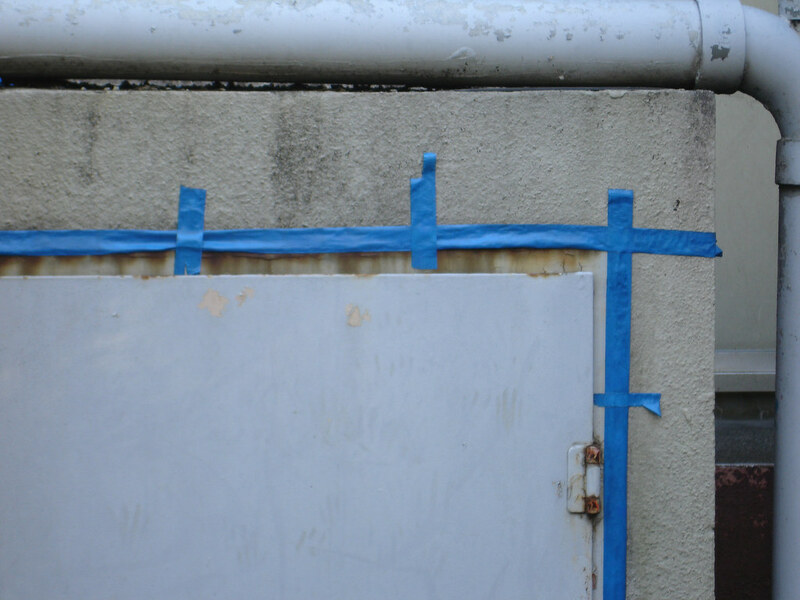 Outdoor wet-space constructed from hose parts and made ‘watertight’ with tape. 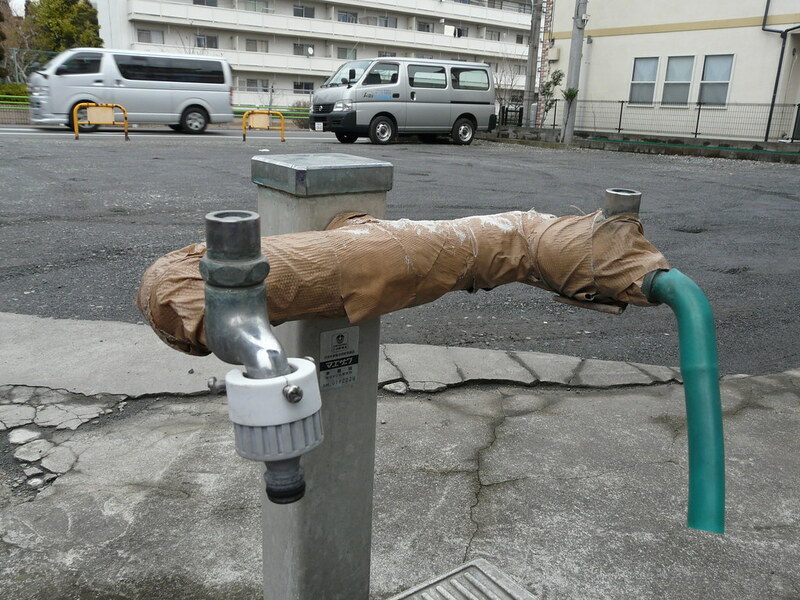 One spout fitted with hose connector for washing cars etc, one spout fitted with plastic piping for casual hand-washing and water-gathering. 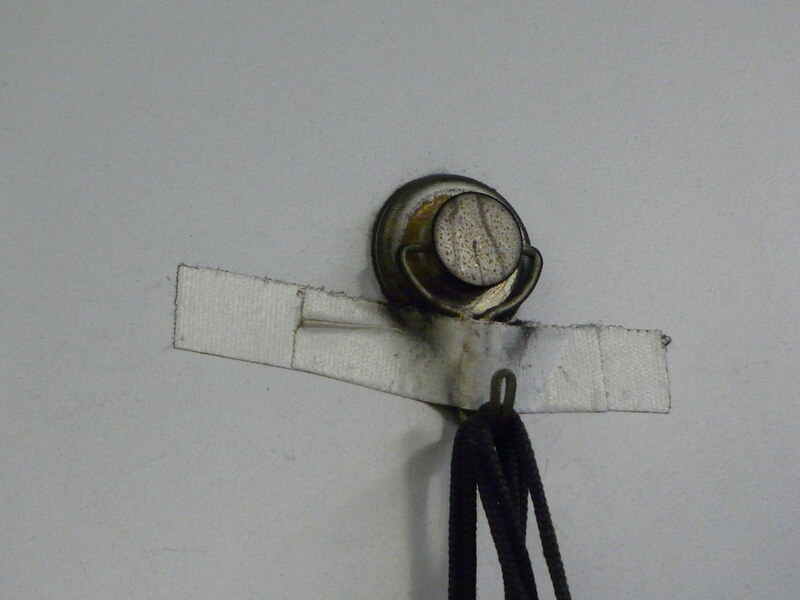 Tap/handle removed to prevent unauthorized use. 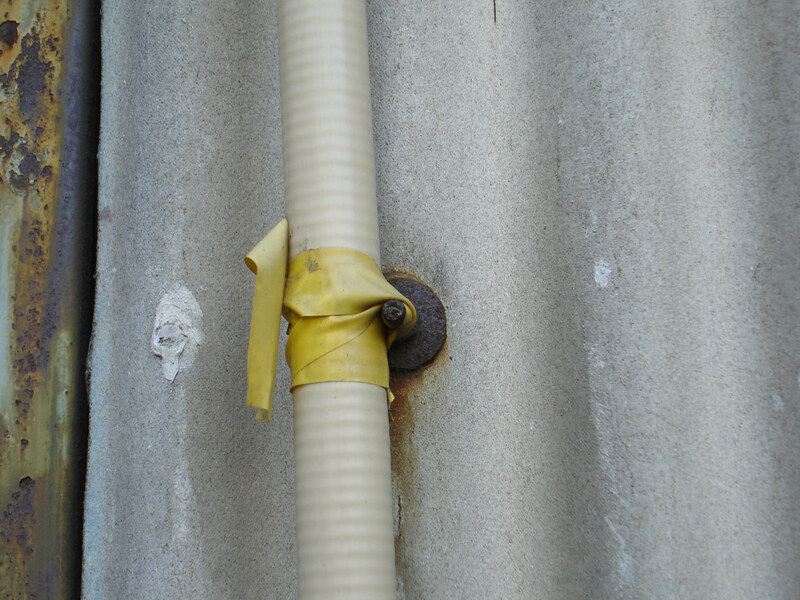 Piping on the side of apartment building attached to corrugated siding with electrical tape. 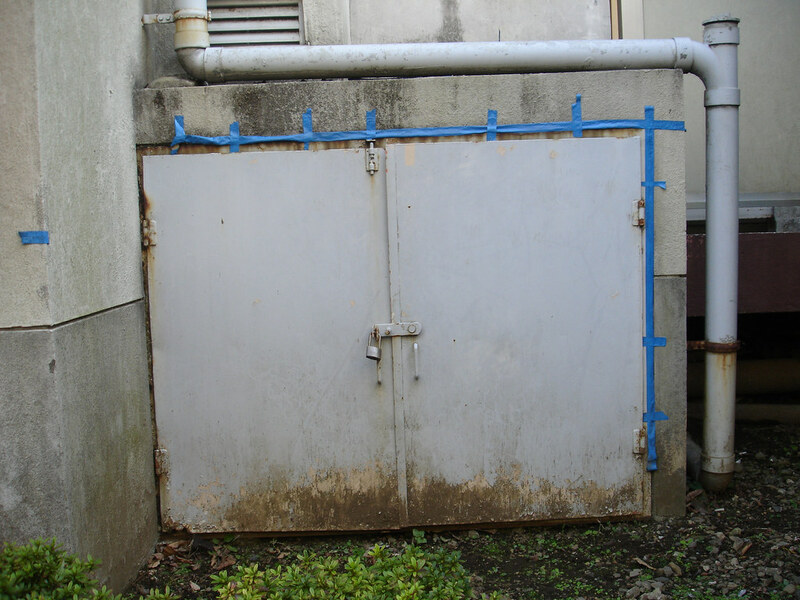 Waterproofing an outdoor storage closet with blue tape.